Snack Time! A good trip up to the Nose of Mt. Mansfield and down the Bruce Trail deserves a good snack, and here we’ve got most of today’s hearty crew enjoying a snack in the sun by the Notchbrook Convenience Store. 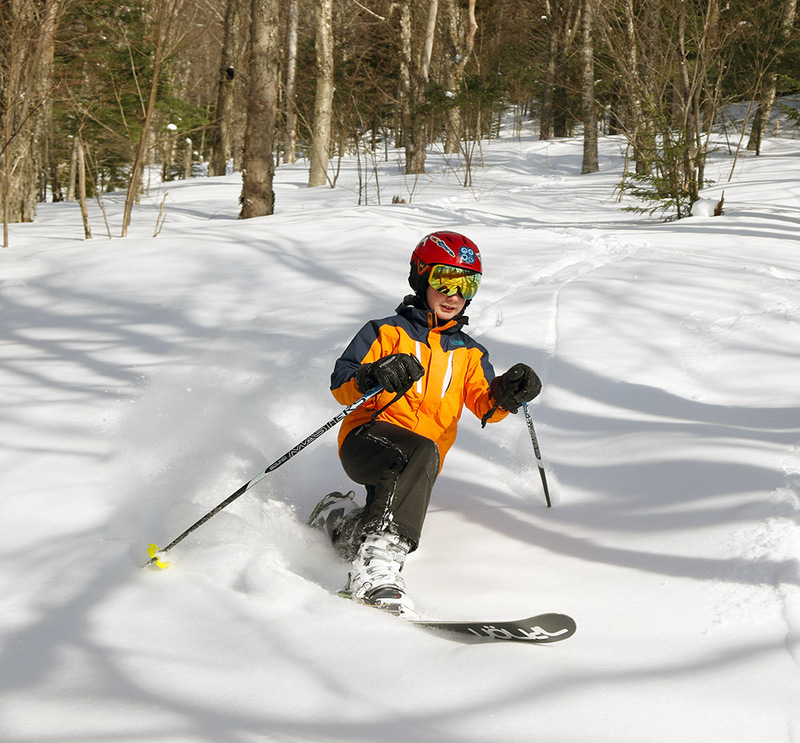 It’s March, and the snowpack is deep here in Northern Vermont, so we planned to take a trip down the Bruce Trail today during our BJAMS ski session. E had recently been chatting with Brian and Joe in the program, and they were both interested in taking their kids on the Bruce, so we all joined together as a group for the run. Knowing the round trip would take most of the afternoon, we started right off heading over to Mansfield and up the Fourrunner Quad. I brought everyone up for the requisite visit to Old Nosedive to enjoy the views and add a bit of bonus vertical to the run. 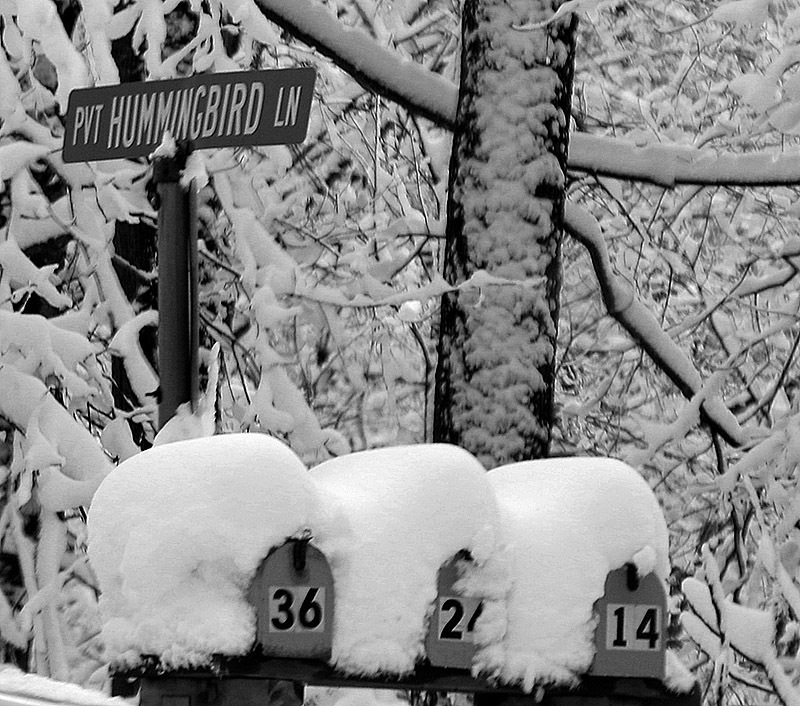 Old Nosedive was packed with snow from our recent storm. 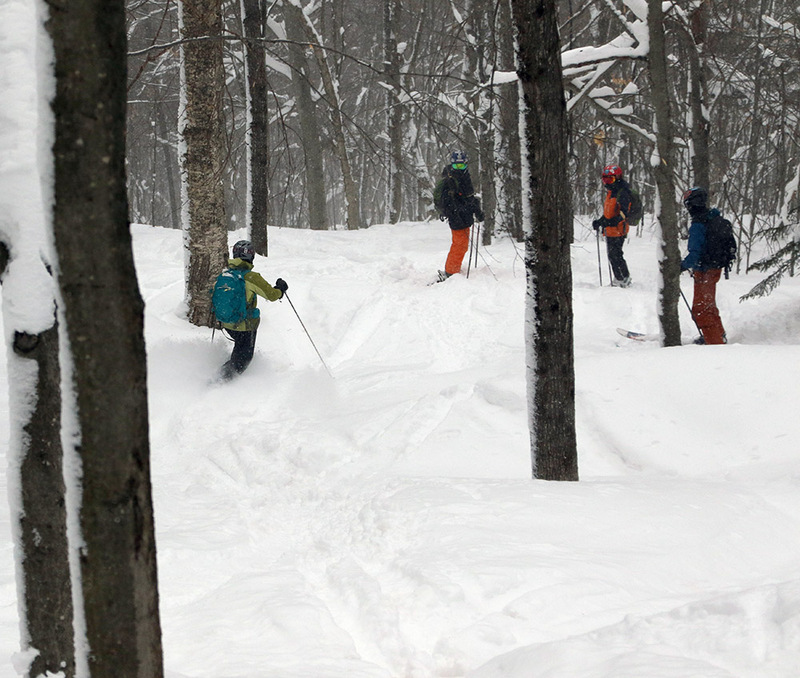 It was dense powder similar to what we experienced yesterday at Bolton, but it skied quite nicely. The Bruce is in simply fantastic shape. That’s not surprising with over 10 feet of snowpack at the Mt. Mansfield Stake, so even the Bruce’s steep, south-facing slopes that lose coverage first are covered with literally feet of snow. 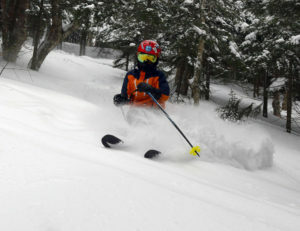 The snow consistency varied from dense powder and skier-packed powder up high, to thick creamy snow in the middle elevation trees, to more spring-like snow in the lower elevations. 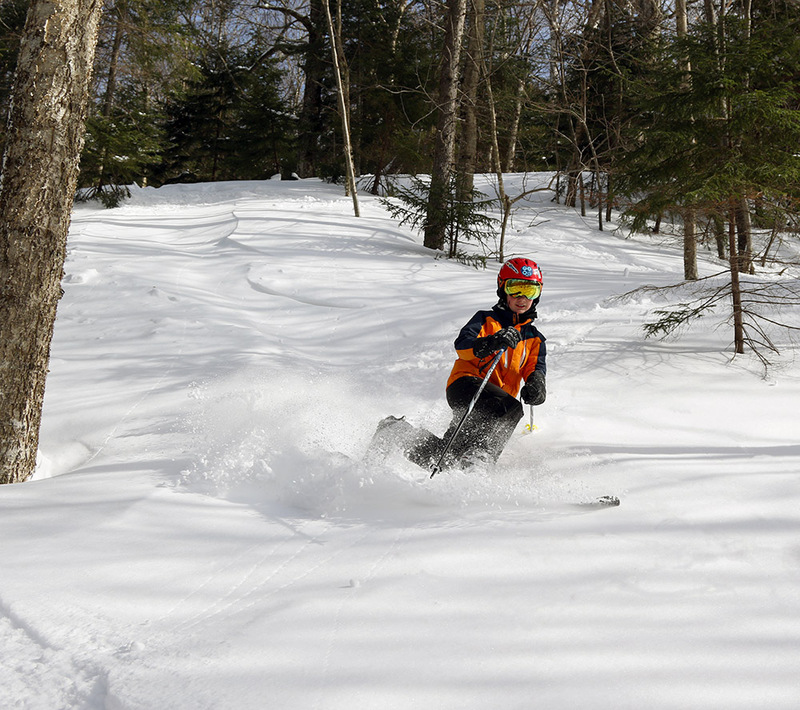 The powder in the lower-elevation hardwoods was definitely getting a bit sticky with sun and warming temperatures, but it still skied quite well in all but the very sunniest spots. Even in the lowest elevations down near 1,000’ on the Nordic area terrain, the snowpack is substantial. 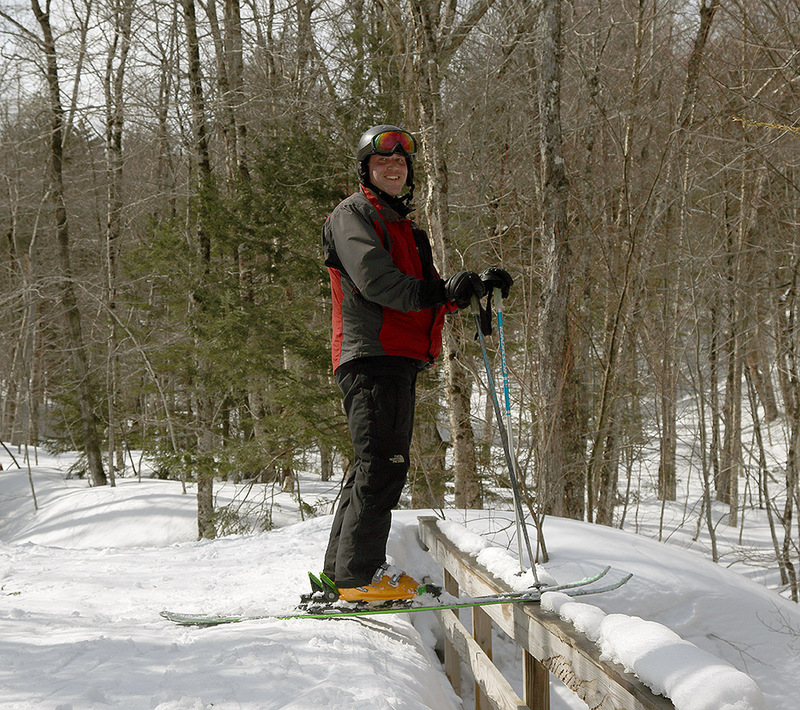 Crossing over the bridges along the Nordic trails we found the snowpack to be at or above the level of the bridges’ railings – which are four to five feet tall! You can literally stand on the railings simply by moving to the edges of the snowpack. The snowpack is level with the bridge railings! The spring snow made the final part of the Bruce descent through the Nordic areas a bit slower than when the snow is more winter-like, but we all simply took our time and enjoyed the casual pace along the meanderings of the Ranch Brook on such a glorious late winter/early spring day. 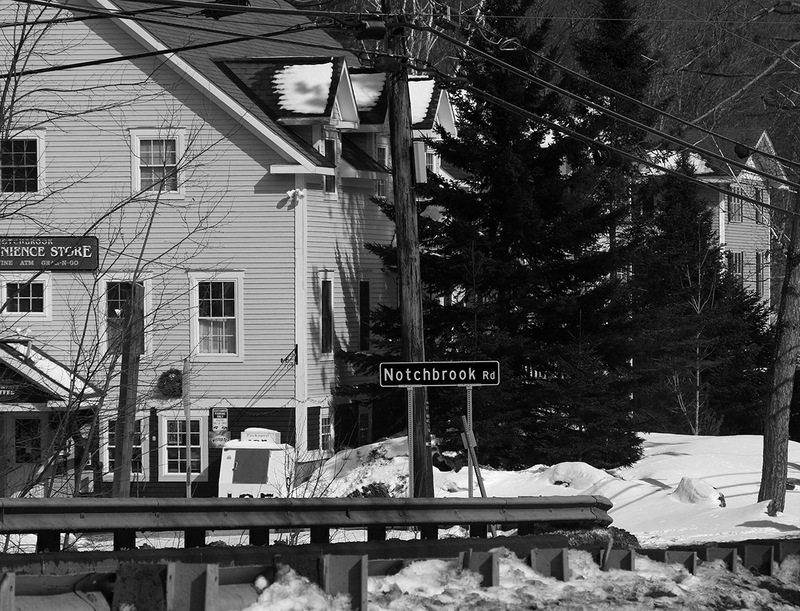 We had plenty of time for snacks while we waited for the Mountain Road Shuttle, so we made ourselves some seats in the snowbanks near the Notchbrook General Store and soaked in some rays as we waited for the bus and discussed our day’s adventure. 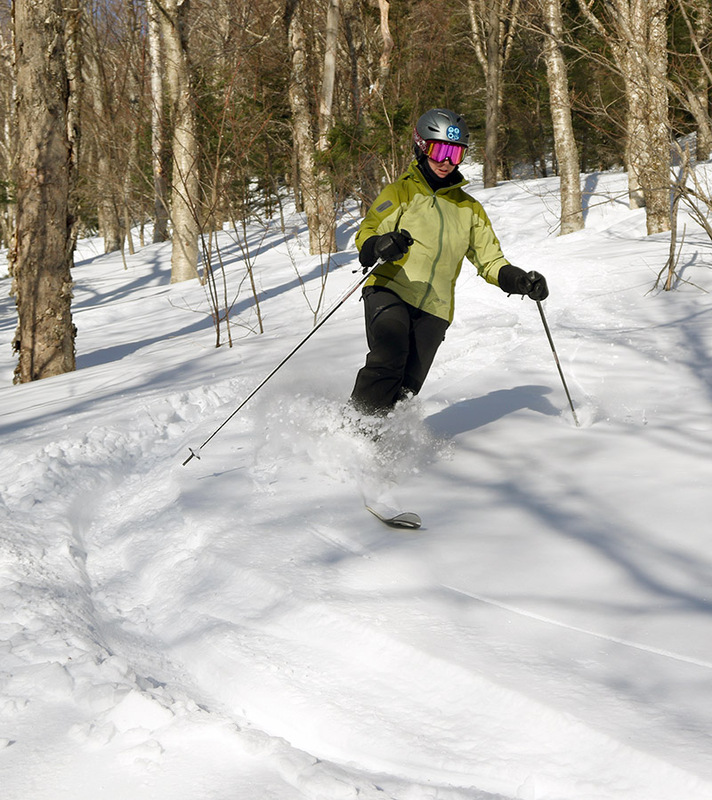 With the deep spring snowpack we’ve currently got around here, the possibilities for skiing in Mansfield’s alpine terrain above the resort are essentially limitless, so hopefully we’ll get a chance to check out some of those options in the coming weeks. 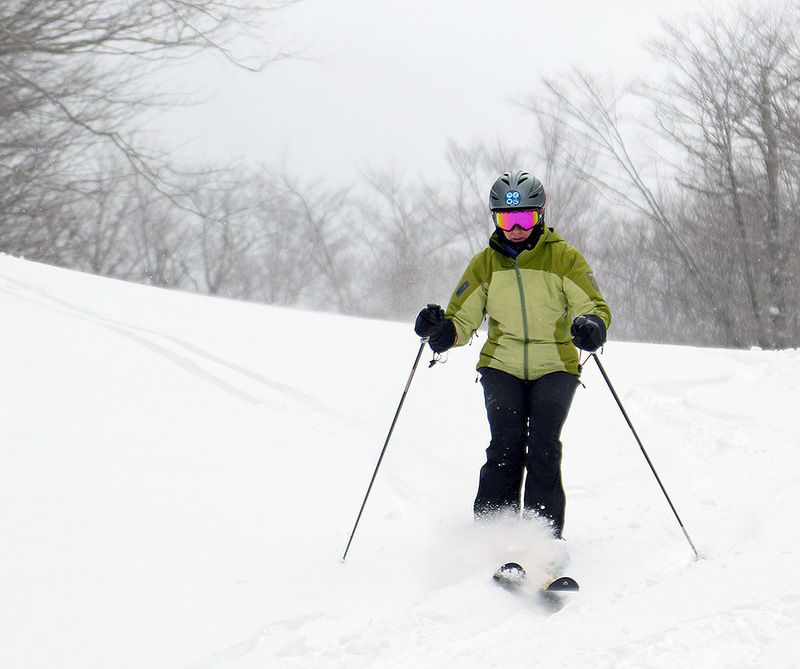 Although our latest round of snow was rather dense, that helped it cover everything in the mountain and put down a solid resurfacing of the slopes. 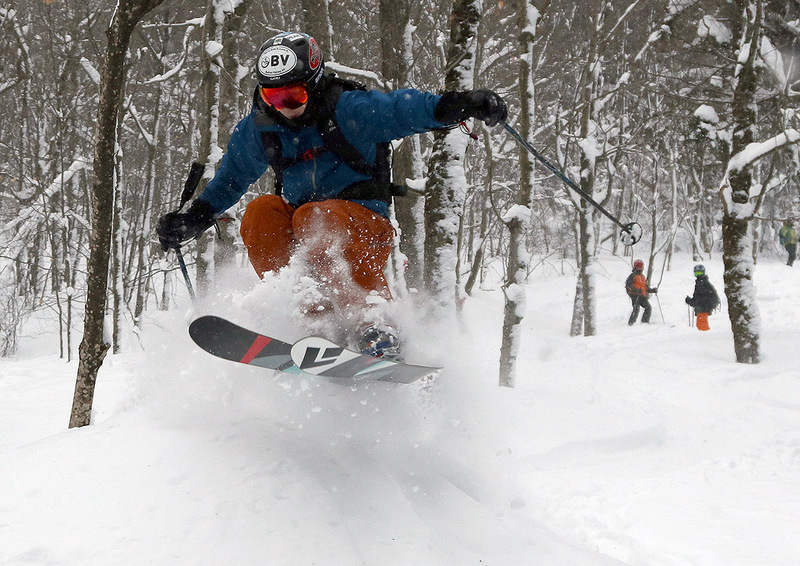 It may not have been the most “champagne” of powder, but it certainly skied nicely. 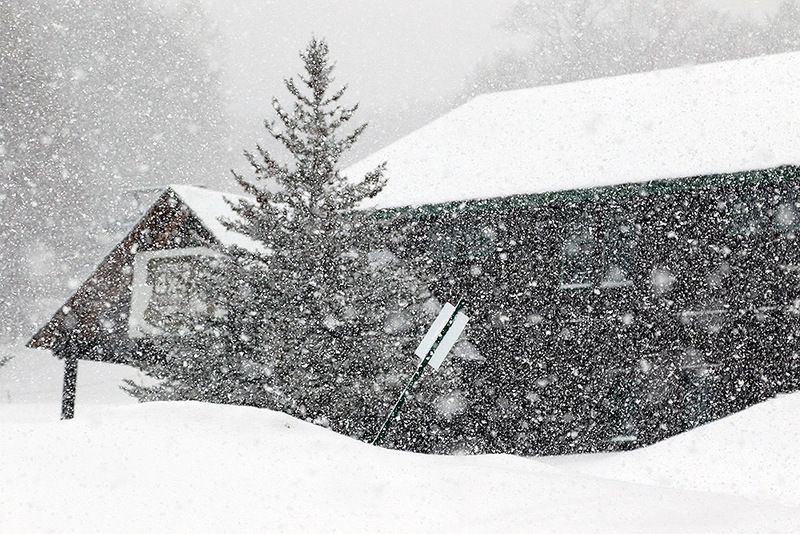 Well ahead of our current winter storm, the weather models were predicting it to be quite a whopper of a system. Multiple upper-level lows were expected to consolidate over the area, then a low pressure center would move up the coast and into Northern Maine before finally departing. Low pressure systems in that area are in a very sweet spot for our local mountains, since it’s excellent positioning to allow Atlantic moisture to be grabbed and wrapped around to the north until it slams into the Green Mountain Spine. 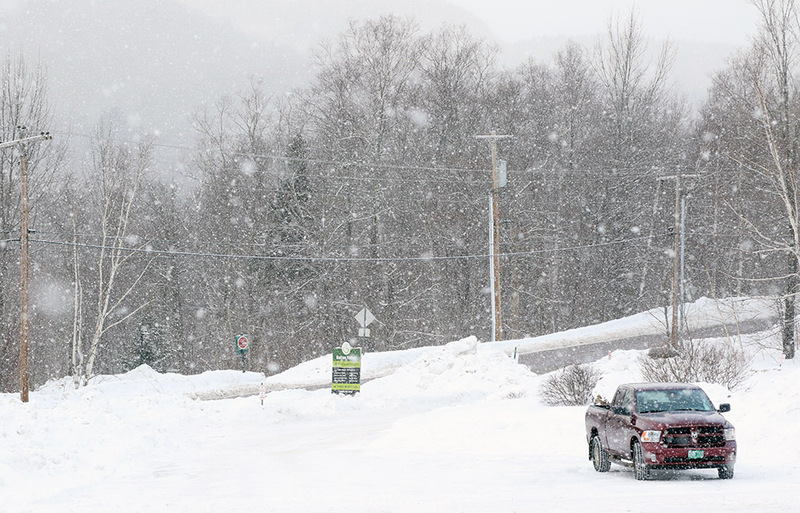 It wasn’t surprising that storm totals were expected to approach 30 inches in the mountains. 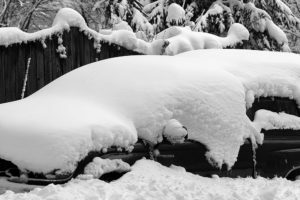 Indeed the local peaks got pounded with snow yesterday and overnight, and when the reports came in this morning, storm totals reached and even exceeded 30 inches. What a spring storm! 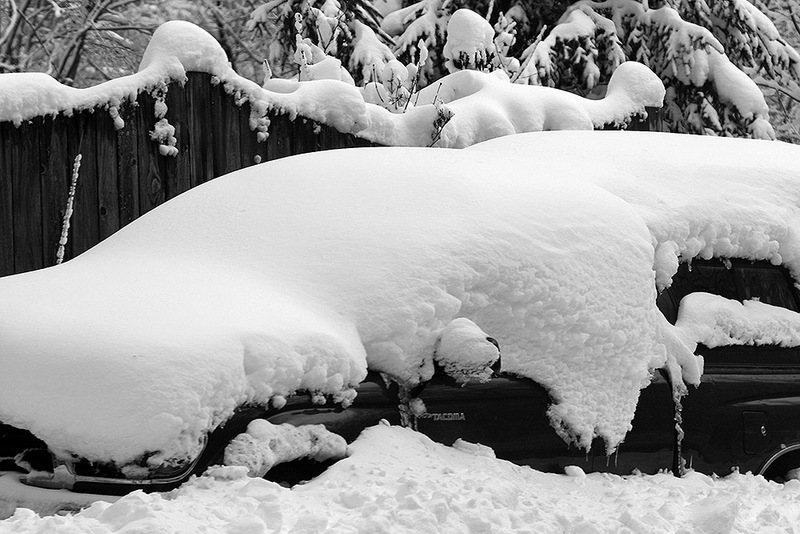 – a snow-covered car along the Bolton Valley Access Road tells the tale. Our plan was to head up to Bolton for some turns today, but all the lifts were initially on wind hold except the Mighty Mite, so we packed Tele and alpine gear and were all set to skin at Timberline until they started running things. By midmorning though, the resort was announcing openings of the Mid Mountain Chair and the Timberline Quad, so we’d be able to start lift-served skiing once we got there. 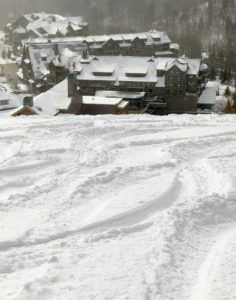 Unfortunately, they were still plowing out the Timberline parking lot and asking people to park up at the main base. 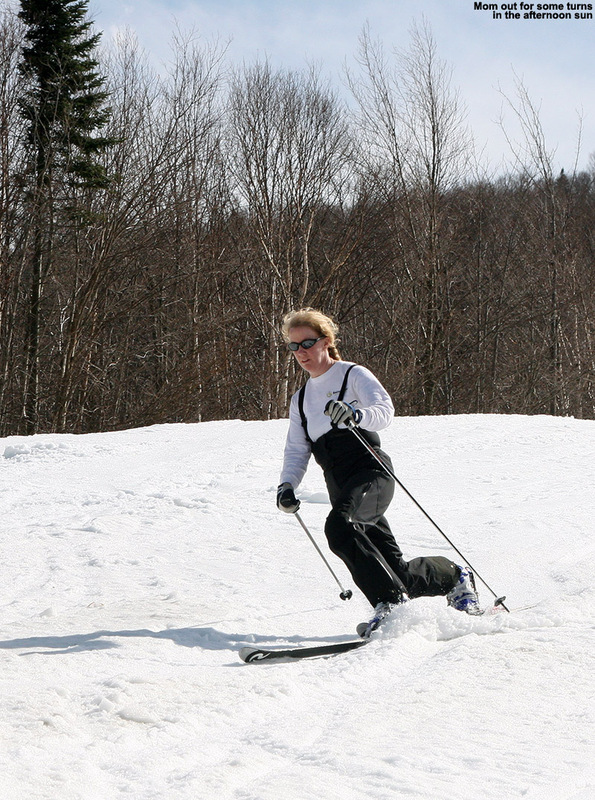 This meant connecting over from the main base to ski Timberline, however the Snowflake Chair, which is the best way to connect over, was down for maintenance. This made for a big line at the Mid Mountain Chair, and that connection still requires a short hike anyway, so we made the hike up Villager to get over to Timberline. We chatted with a patroller coming down Villager, and he wasn’t thrilled about our hike because it wasn’t a designated uphill route, but he understood under the circumstances. He just reminded us to stay to side, well out of the way of any resort vehicles that might be using the trail. It’s not really a long hike, but it did have the benefit that we got in some of our cardio today even though we didn’t end up skinning. 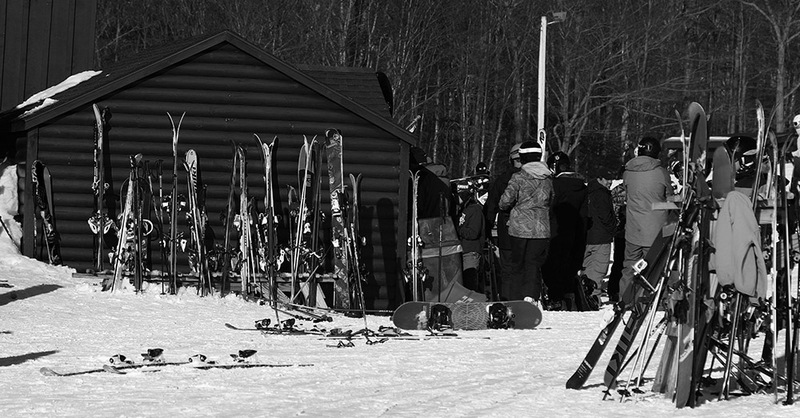 Wind holds on various lifts at the mountain today made it challenging to get from the main base over to Timberline, so many folks made the trip up the Villager trail to get there. In related news, this storm pushed the snowpack at the Mt. 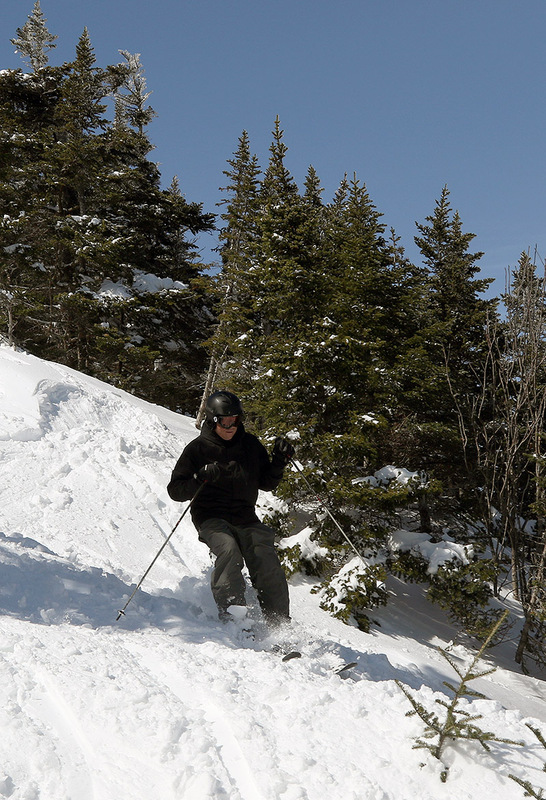 Mansfield stake past 10 feet, so the snowpack in the mountains is in great shape as we continue into spring. 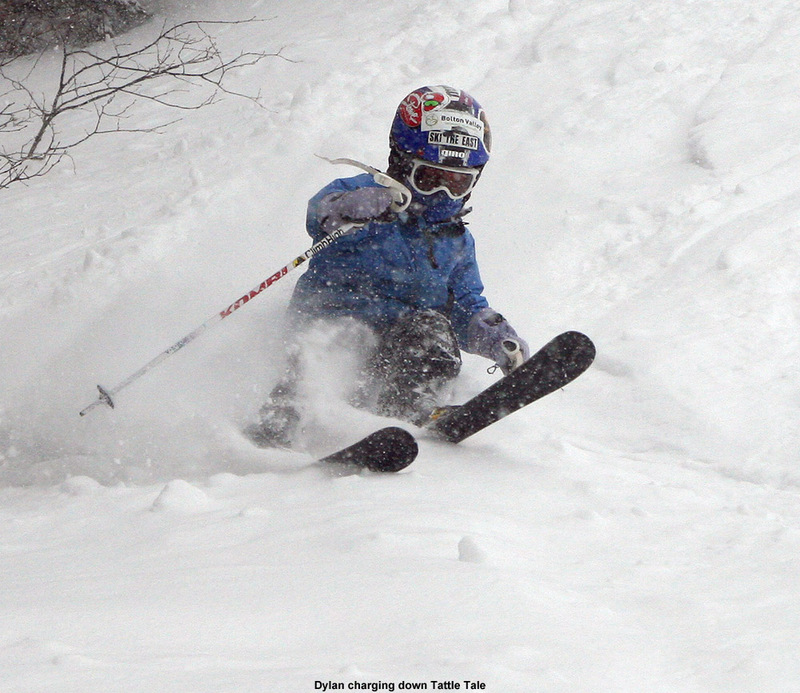 We’ve known about the potential upslope snow on the back side of Winter Storm Taylor for several days, and today looked like the optimal time period to get some of those Northern Greens powder turns. 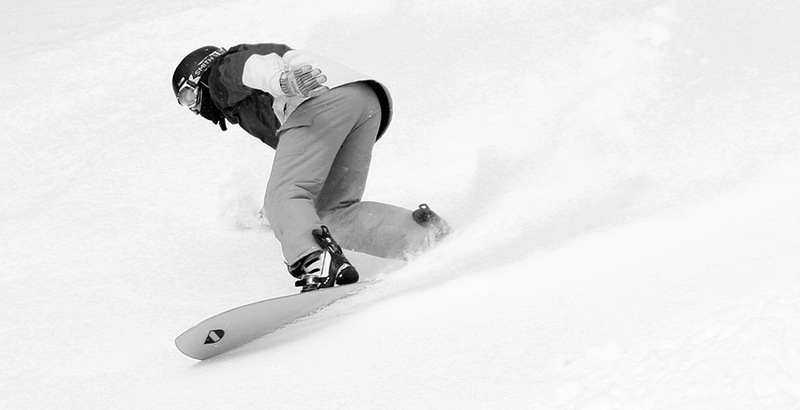 But, you never know quite how much powder you’re going to get until it happens. 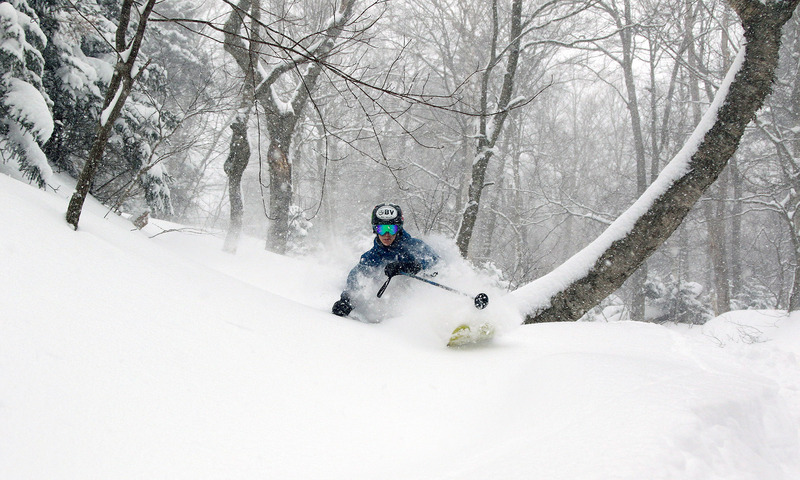 Scott Braaten laid out his thoughts yesterday at Braatencast, but I’d say Mother Nature delivered even better than expected. The first thing we heard from Scott this morning in the Northern New England thread at American Weather Forums was: “The orographic lift came through last night. That’s for sure.” We knew it was game on, and we sure love it when the Northern Greens do their thing. 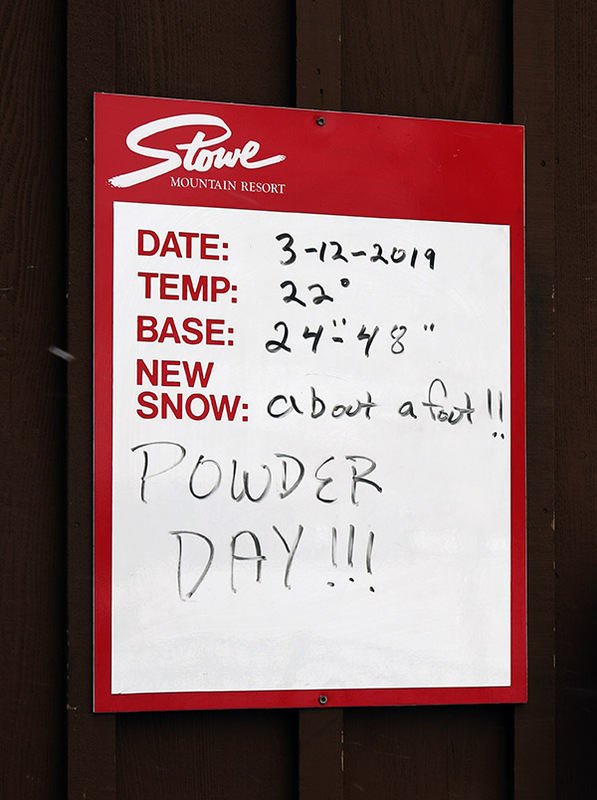 I was planning to head to Bolton Valley for a bit of touring this morning, but when I saw they were reporting about 4 inches overnight, whereas Stowe had early reports of 8 or 9 inches, I switched up my plans and decided to do a few lift-served runs at Stowe instead. My snow analyses from the morning indicated that the new snow had come in around 5% H2O, which was a setup for some great powder turns. Enjoying some powder and views as I run one of my laps on the Sunny Spruce terrain today. I had a bit of interesting serendipity on this morning’s outing. 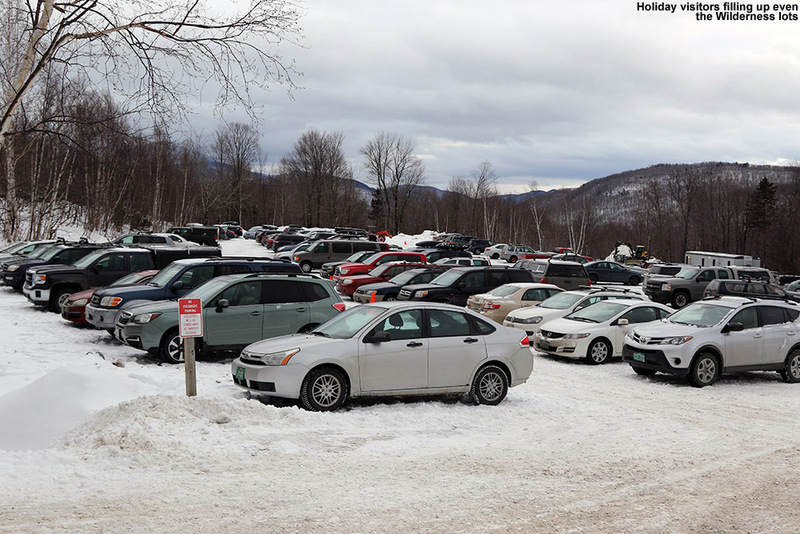 I parked in the upper Gondi lot, planning to do most of my skiing there, but I had a pass issue that required me to head over to Spruce. Once I’d gotten things straightened out with my pass, I decided to just roll with it and catch some runs while I was over there. 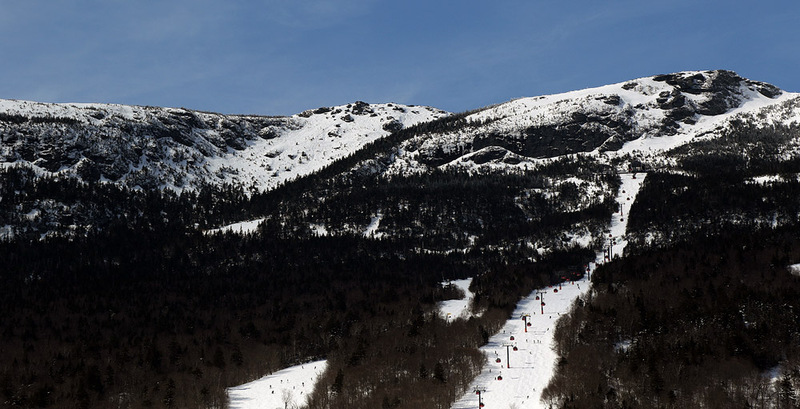 I headed out to the lifts and noticed something surprising – the Sensation Quad was running, but the Sunny Spruce Quad was down. The reverse is common if there are wind issues, but certainly not the combination they had today (it turns out it wasn’t a wind issue, it was mechanical I guess). Anyway, with Sunny Spruce down, it was pretty much country club powder skiing on that terrain for the few folks that felt like accessing it. I did an initial run on Sensation, which was pretty quiet aside from the NorAm races, and got some of the first tracks down Spruce Line. After that I did a couple of laps on the vacant Sunny Spruce terrain, running a circuit with the Meadows Quad and Sensation Quad, and of course including a hike to the top of Spruce Peak each time to get in that extra powder and make up for the fact that I was riding lifts instead of skinning. It was snowing nice fat flakes all morning, and the increases in snowfall intensity were often quite notable as you headed up in elevation. 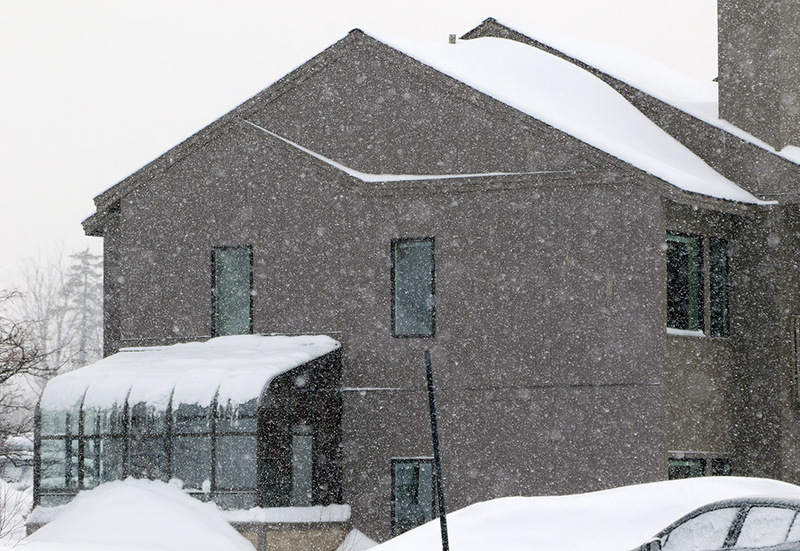 It typically wasn’t an intense pounding snow, but often nice and steady, and sometimes you’d have that fairly decent snowfall with sunshine at the same time. There were a couple of times with the perfect simultaneous combinations of flakes and sun that I had to stand there in awe and soak in the mountain scene. And it was all gorgeous upslope flakes – the 5% H2O I’d found in my morning snow analyses was probably about what we had where the snow wasn’t affected by any wind. 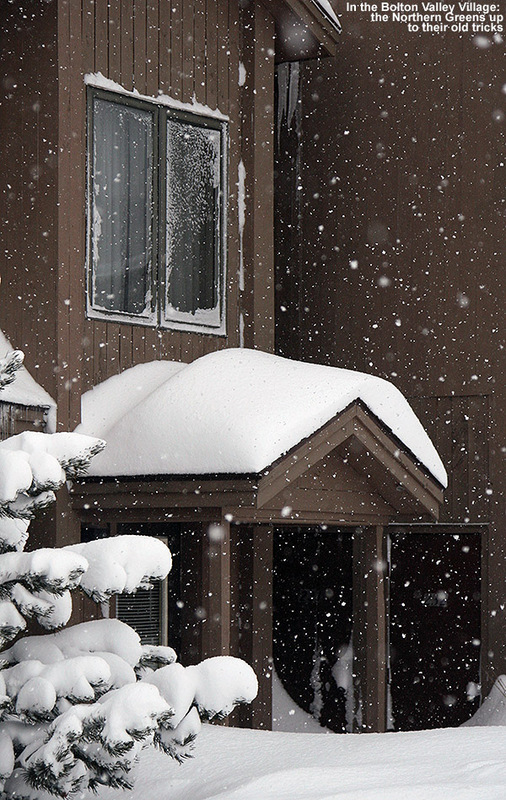 It was simply great snow quality with some good right-side-up nature to it thanks to some dense snow that had fallen at the beginning of the storm cycle. 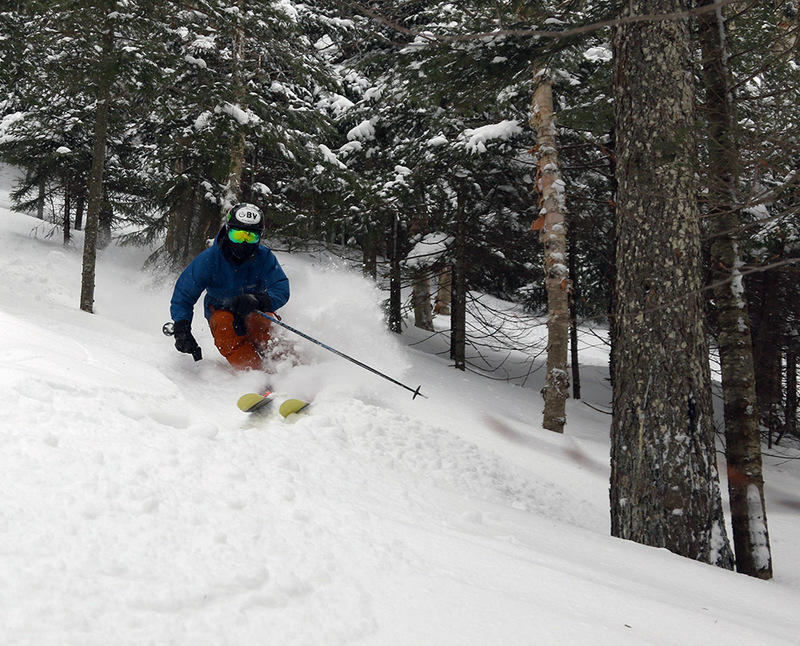 Most off piste (and even some on piste) terrain I encountered was definitely delivering that 48-hour total of 13” that I’d seen in Stowe’s snow report. My first depth check of the day was in the Meadows East Glades, and my measurement came right in at 12 inches. I checked in spots off Upper Sterling and was typically getting 12-14”. 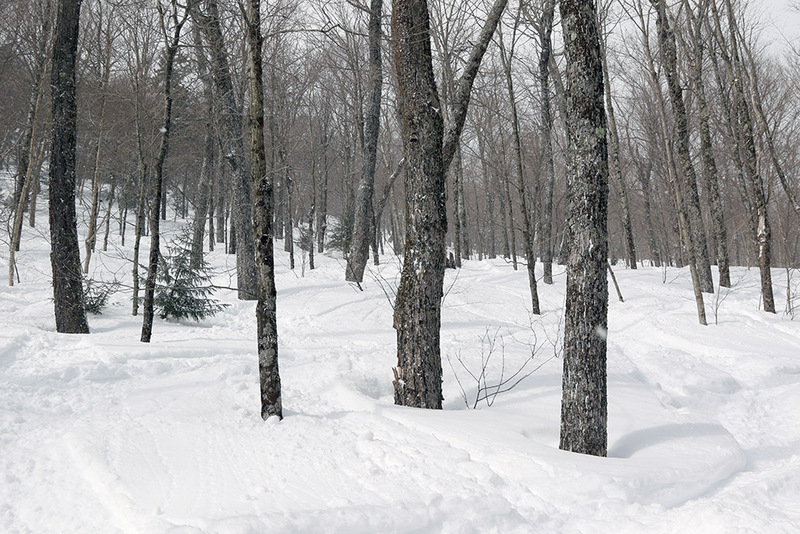 I eventually got back over to the Gondola terrain and was really impressed with the skiing in the Bench Woods. 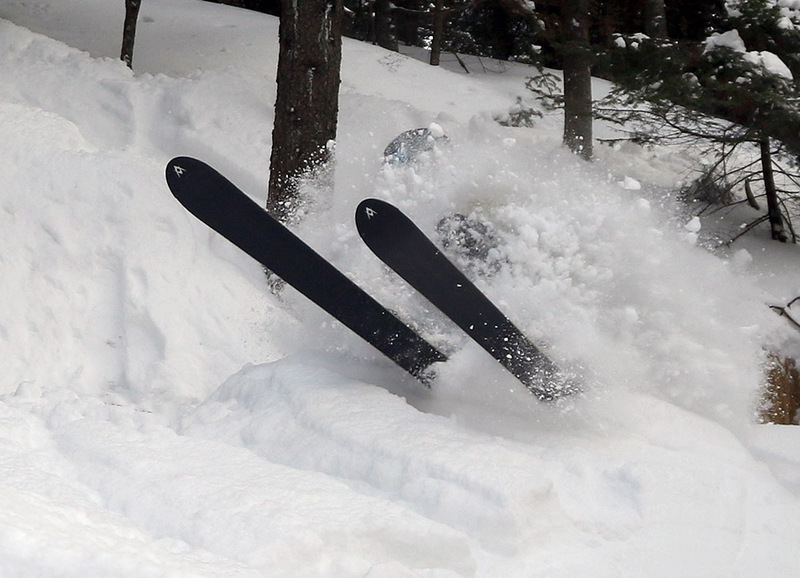 It was skiing much deeper than a foot at times, and doing some checks I was getting powder depths of 22-24”. 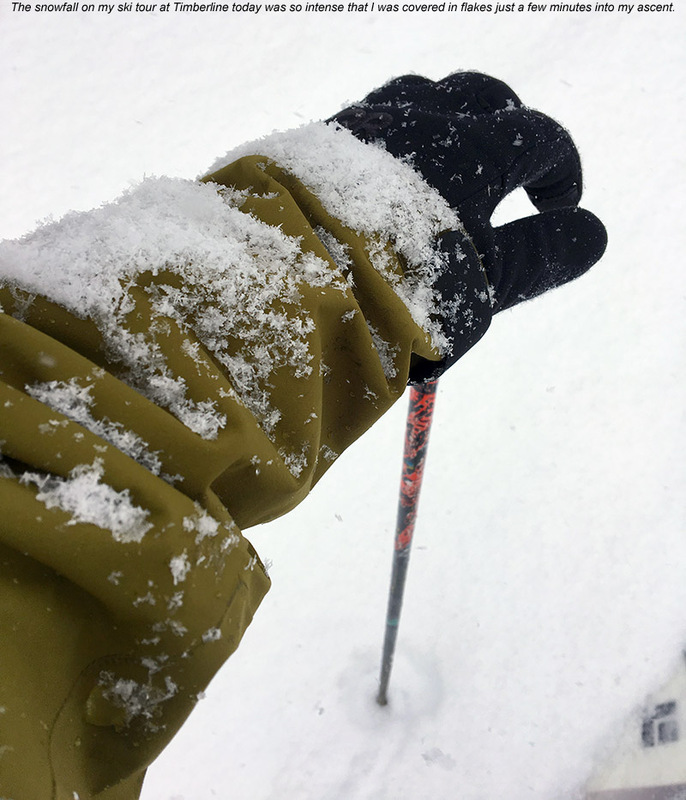 I did push through some sort of slightly thicker layer in those measurements, but it must not have been too sturdy because I was definitely skiing a lot of lines where the snow had that “up to the thighs” feeling. That’s typically in the two-foot realm vs. the one-foot realm. 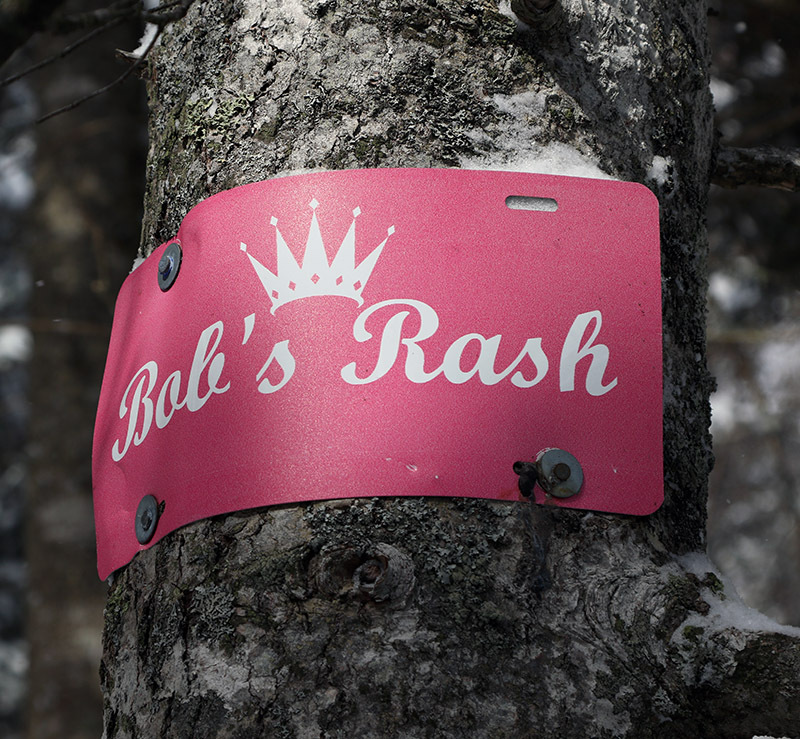 I found a sign I’d never seen in that area that said “Bob’s Rash”, and I have no idea how much of the terrain that sign was meant to cover, but the lines below it were beautifully steep and loaded with the kind of powder that billows up above your waist. 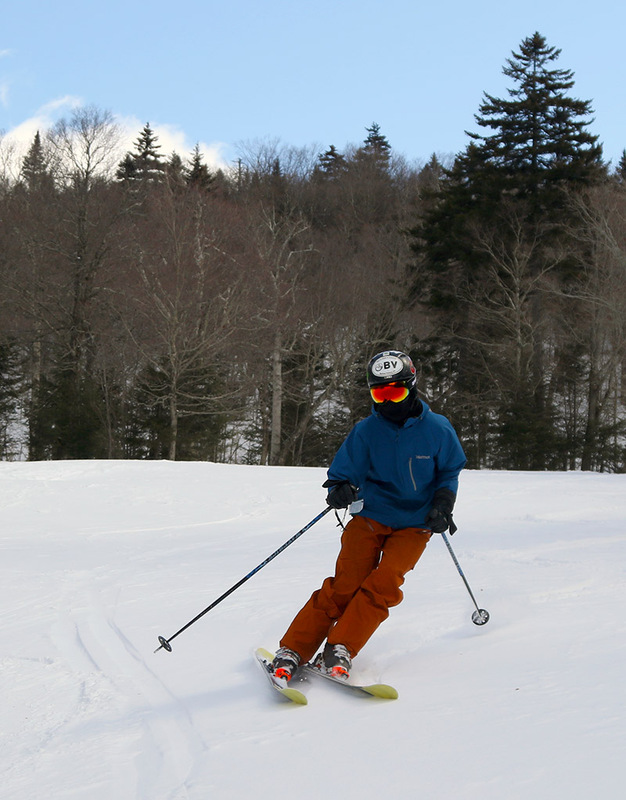 Today’s temperatures were cold enough to keep things light and dry, but certainly not January frigid, so it was an all-around great morning. It was another world once I got back down into the valley – it was mostly sunny down low while it was still snowing away at the mountain. 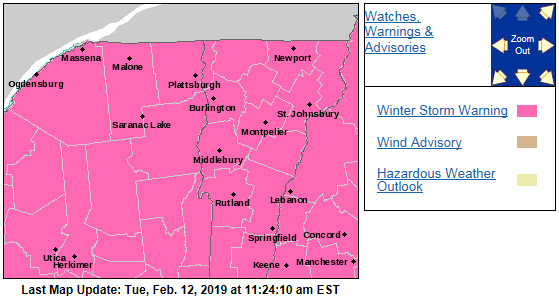 We’ve had some nice storms over the past couple of Marches, with Winter Storm Skylar last March, and Winter Stowe Stella the March before that. This year’s Winter Storm Taylor wasn’t quite as big as those, but it was an awesome sleeper storm that brought the goods without as much hype. 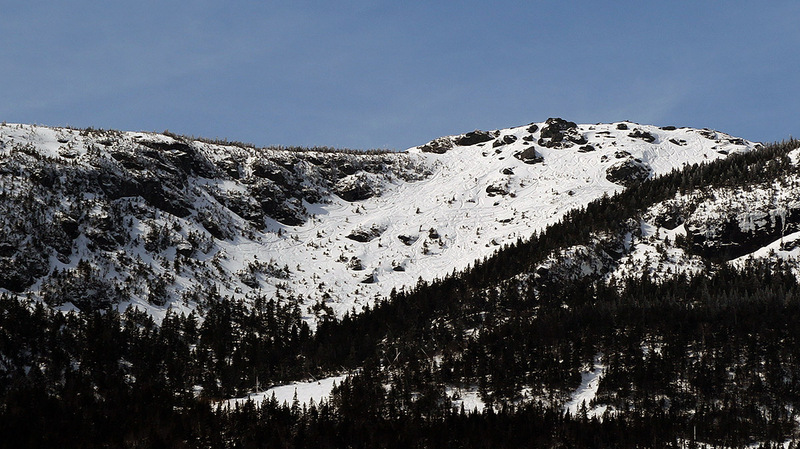 The snowpack at the Mt. Mansfield Stake is now sitting at around 120 inches, and the skiing is great at all elevations. Who knows how many other big storms we’ll be getting this season, but we’ve got the rest of March and April to find out! It’s been quite a cold week with low temperatures in the single digits above and below zero F, but as of today the weather is warming up to be a bit more in tune with March. Like yesterday, the forecast for today was absolutely clear, and with temperatures expected to edge into the 30s F, Dylan, E, and I headed up to Bolton Valley to catch a few afternoon runs. The temperature was in the mid-30s F at our house in the valley, and right around the freezing mark when we arrived up at 1,500’ at the Timberline Base. The mountain has picked up 8 inches of new snow in the past three days, but I was unsure about how well it would cover up the old base. It turned out to be fine, and the powder was in great shape at all elevations aside from the sunniest spots where it had been affected a bit by the warmth. My depth checks on the upper mountain typically revealed about 8 inches of powder, so the mountain probably picked up a bit more than that before settling. 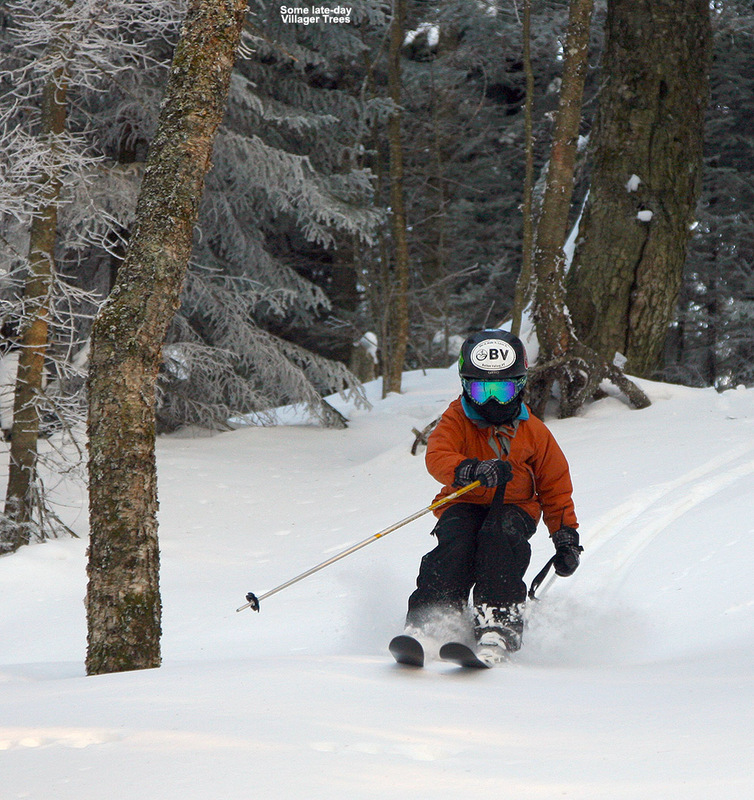 Telemark turns, blue skies, and powder this afternoon for E! The lower elevations of Timberline were nicely warming in the afternoon sun to produce some beautifully soft surfaces on the groomed runs, but we didn’t really find any snow that had lost its winter consistency. We ventured all the way over to Wilderness and in those high elevations we found some nice powder on White Rabbit and Snow Hole. 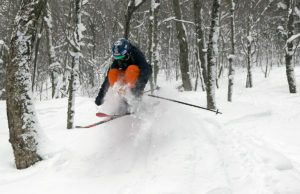 Even down in the Timberline elevations we found that the KP Glades held a multitude of fresh lines through dry powder. 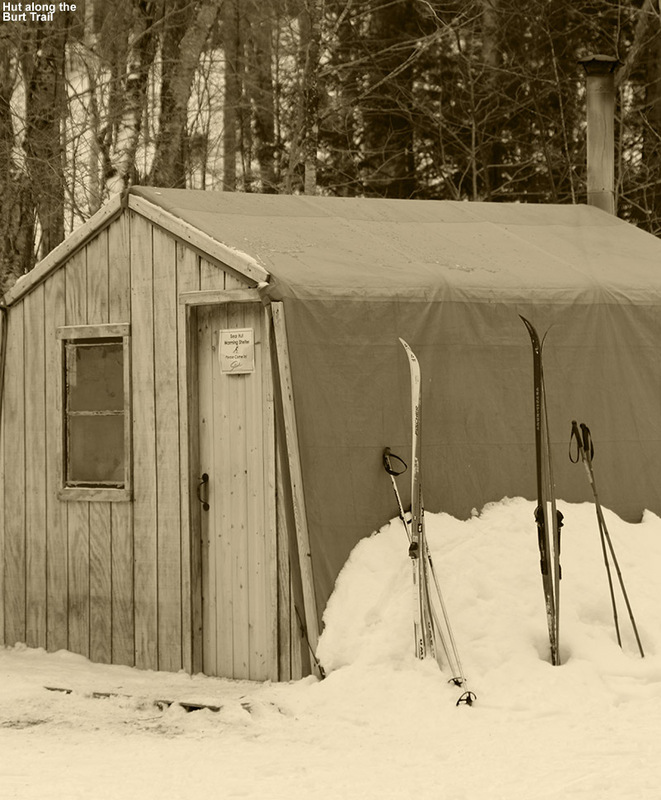 The waffle cabin, adored with skis and starting to disappear under the snow, was a huge hit with today’s gorgeous weather based on the size of the line out front. Starting tonight we’ve got Winter Storm Taylor moving into the area, which should bring some fresh snow to the slopes for tomorrow. 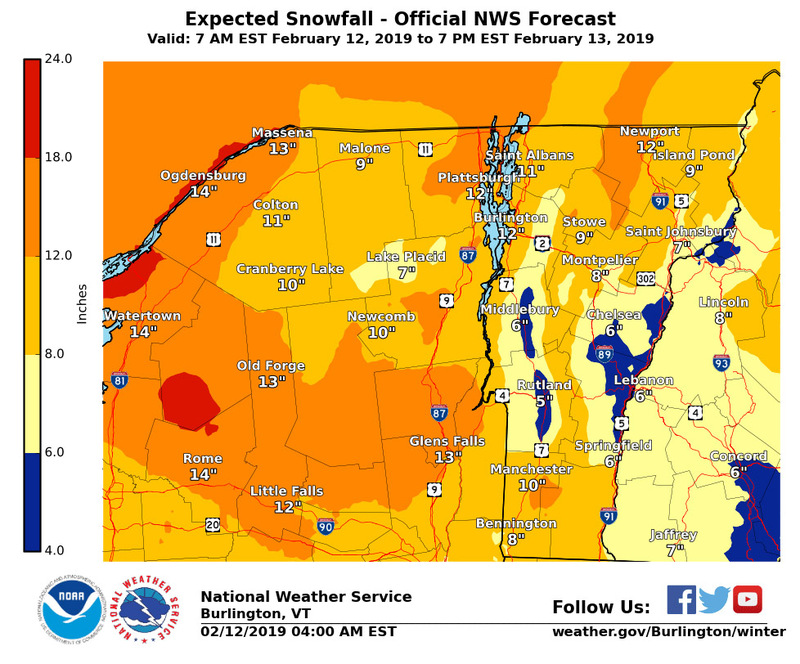 The forecast indicates that the upslope snow on the back side of the storm cycle should continue right through Tuesday. 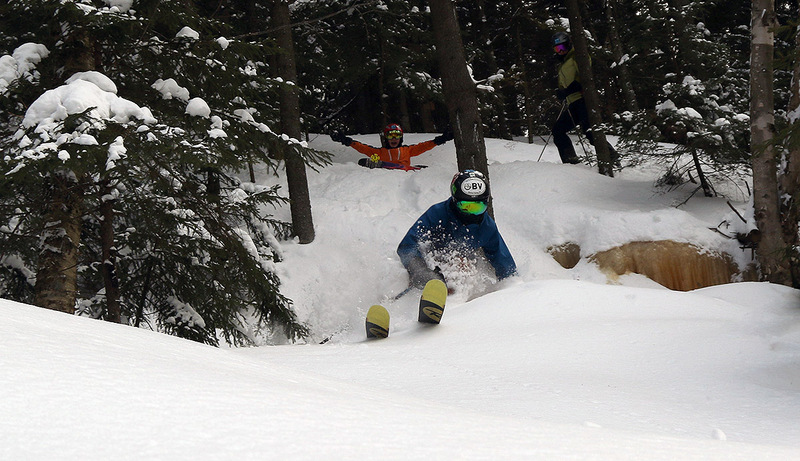 Dylan and I were very impressed when we tried to check on the depth of the new powder from this week. We couldn’t quite a good measurement because the new snow simply blended in with old, but we were impressed with the fact that we could stick our poles into the snowpack right up to the handle and beyond. 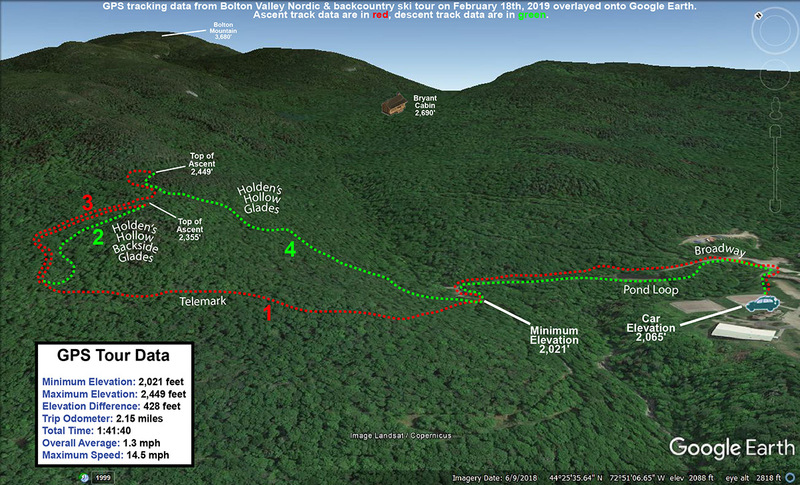 The Bolton Valley snowpack is deep! This week wasn’t especially snowy, but we had at least some modest accumulations, with Bolton Valley reporting 9 inches during the period. 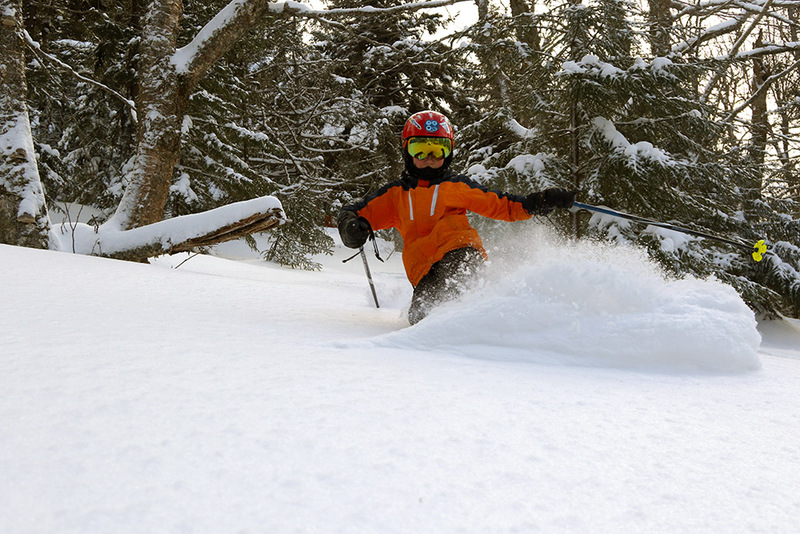 Overall ski conditions have been quite good as of late though, so we expected there to be plenty of good powder skiing in the usual stashes with just these recent rounds of snow. 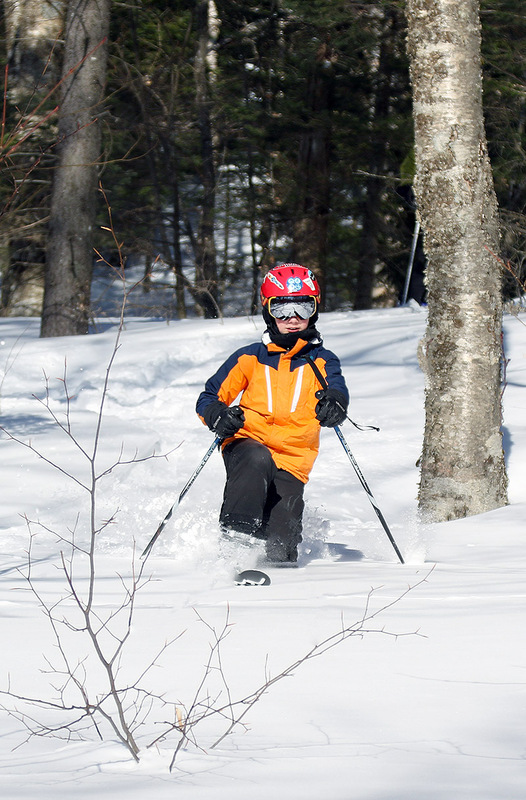 E and Ty were both a bit under the weather, but Dylan and I headed up to the mountain with our Tele skis for a good session of powder turns and exploration. Temperatures were really nice, well into the upper 20s F for our midmorning arrival at Timberline. 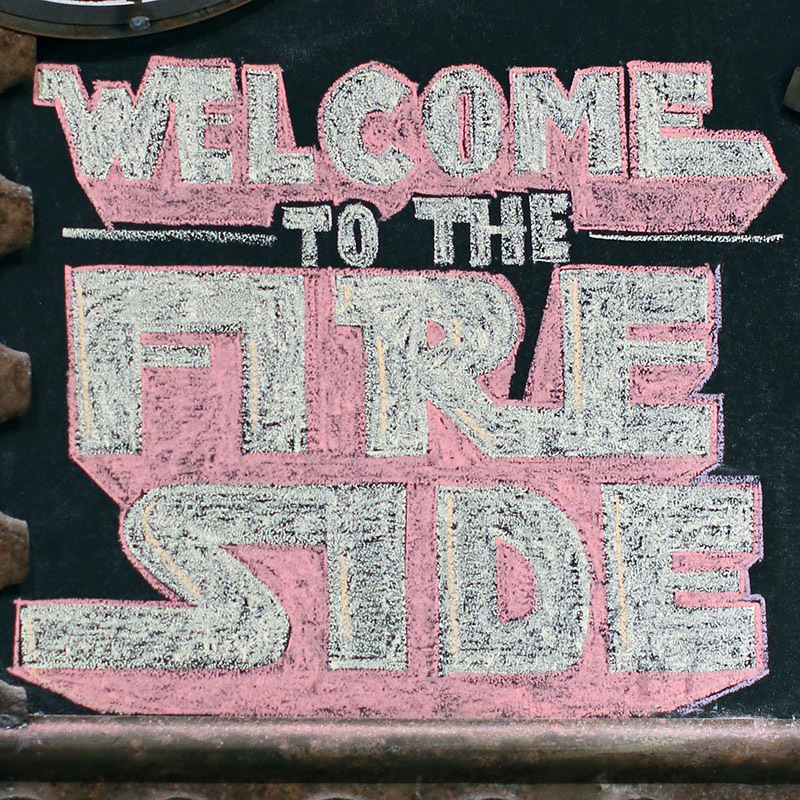 D and I put together what was essentially a truncated version of the great session that the family had last Saturday. We hit the whole breadth of the mountain, traveling all the way from the bottom of Timberline over to the top of Wilderness, and back again. 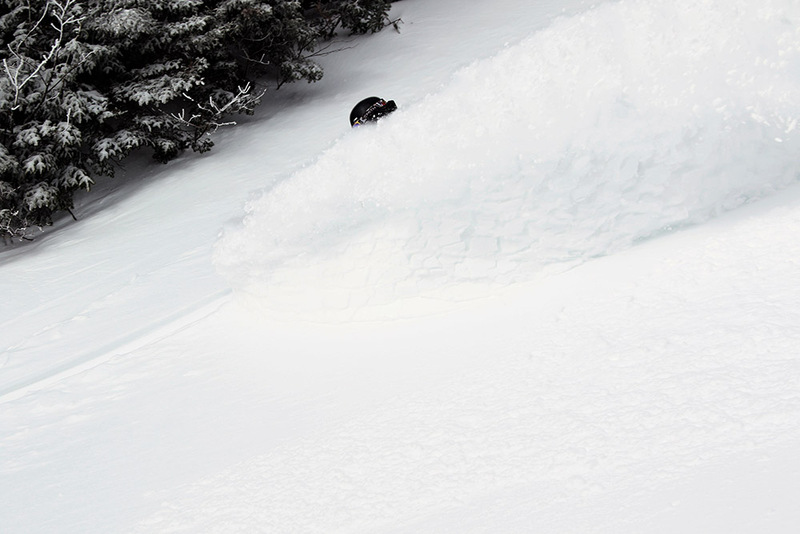 We hit powdery favorites like White Rabbit, Snow Hole, The Crack, and Maria’s. 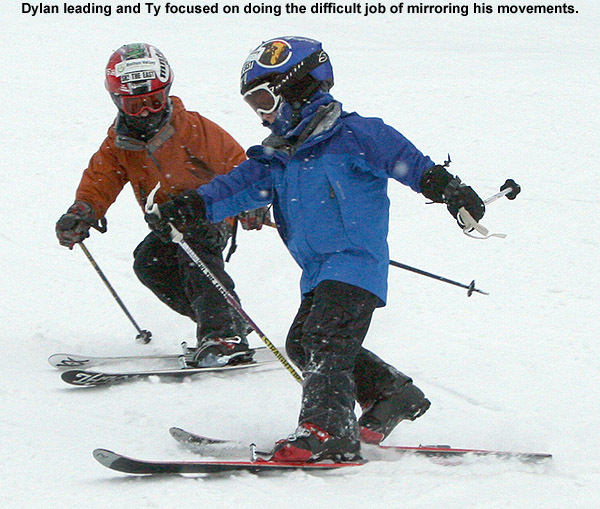 Dylan was skiing really well on his Telemark skis, and it was fun to watch him developing the wherewithal to throw in alpine turns among his Tele turns whenever he’d be in a tight space that called for it. 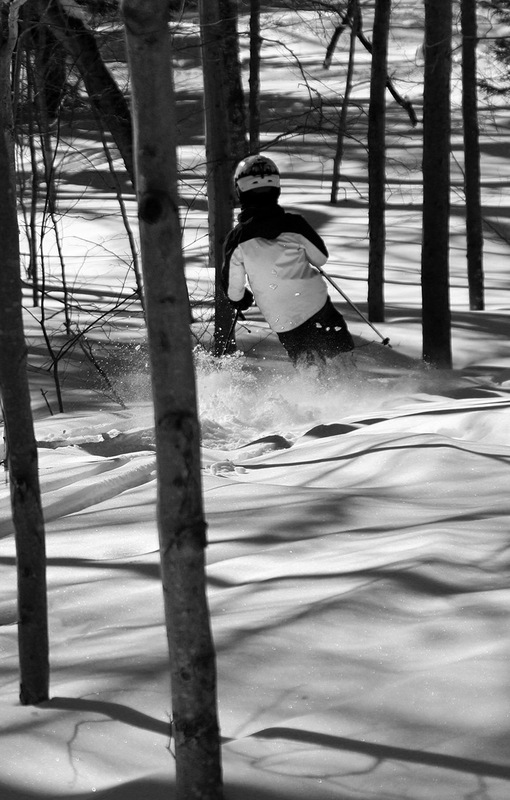 Dylan enjoys surfing some of that powder out there today in the trees at Bolton Valley. 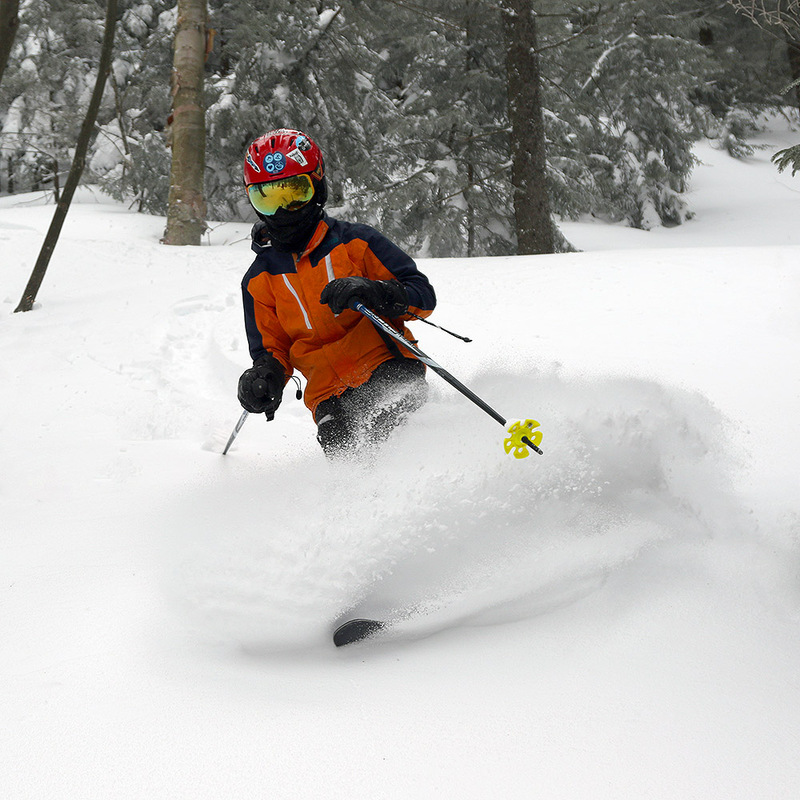 We caught some really nice powder turns, and it was hard to say exactly how much of the surface snow was new, but it was certainly several inches. We had fun checking snow depths around the 3,000’ mark, and you could simply push your pole down into the snow right up to the handle… and then keep going deeper if you wanted to. 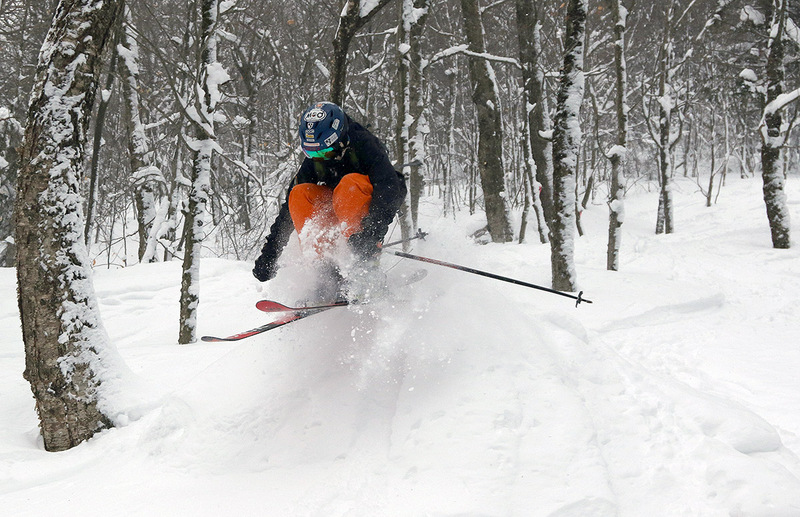 While the powder today wasn’t quite as fresh as what we experienced last weekend, it’s all just great skiing at this point. 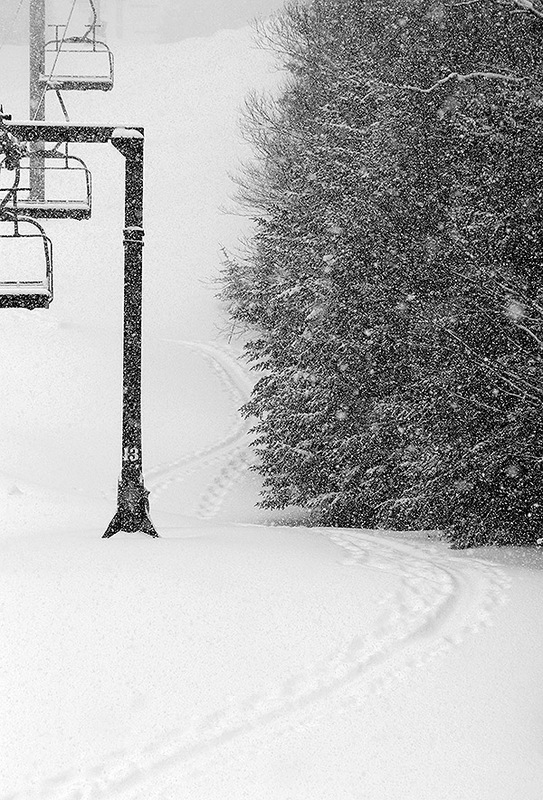 Today was another one of those days where I really hadn’t expected to ski. 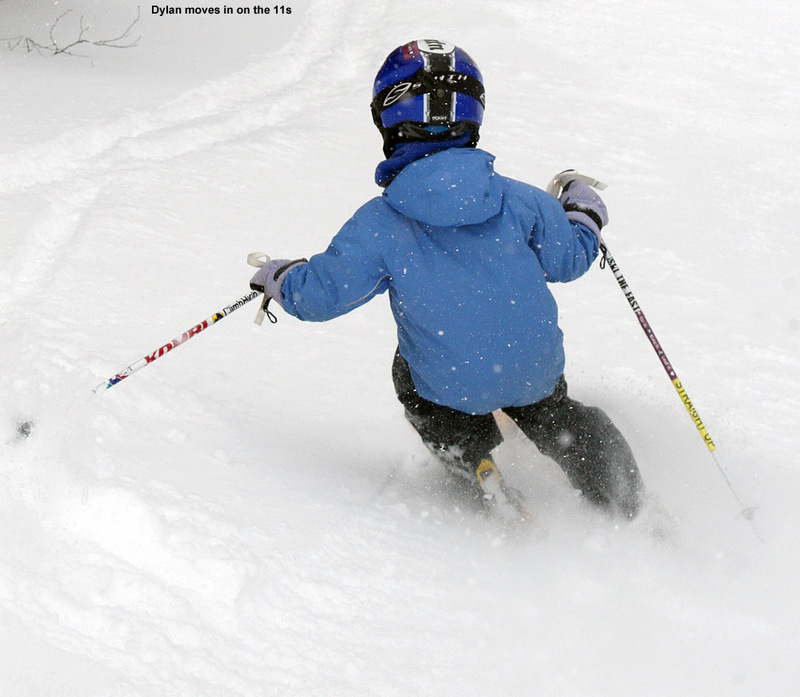 We had a great lift-served family ski day on Saturday, and then I went on a backcountry reconnaissance tour on the Woodward Mountain Trail and Woodward Mountain yesterday, so I’d already had a decent dose of weekend skiing. Today was going to be a bit chillier, and I was happy to simply catch up on some work at home, but Mother Nature seemed to have other plans. It snowed all morning at our house in Waterbury, with big, fluffy, champagne flakes, and we’d picked up 3 to 4 inches of new snow by noontime. If it was snowing like that down at our house, I could only imagine what might be going on 2,000’ higher up at the mountain, so I decided that I should do a quick ski tour and find out. With a short Bolton Valley tour in mind, I decided to follow up on a tour I’d made with E and the boys about a month ago. 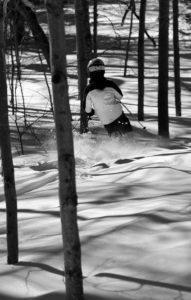 On that tour we wrapped around to the back side of Holden’s Hollow, and there were some nice glades in that area that I wanted to explore. Now that I’m familiar with the layout there, I know that’s a great setup for a quick tour. 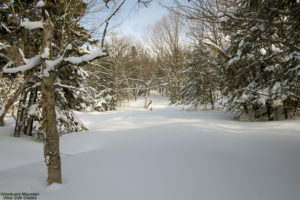 It was still snowing rather vigorously when I got up to the mountain, and it was hard to tell exactly how much new snow had fallen over the previous layers of powder, but it seemed to be at least as much as we’d picked up down at the house. 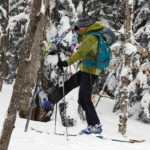 The approach section of the tour along Broadway went smoothly, and I’d quickly wrapped around on the Telemark trail and reached the ridgeline in the Holden’s Hollow area. 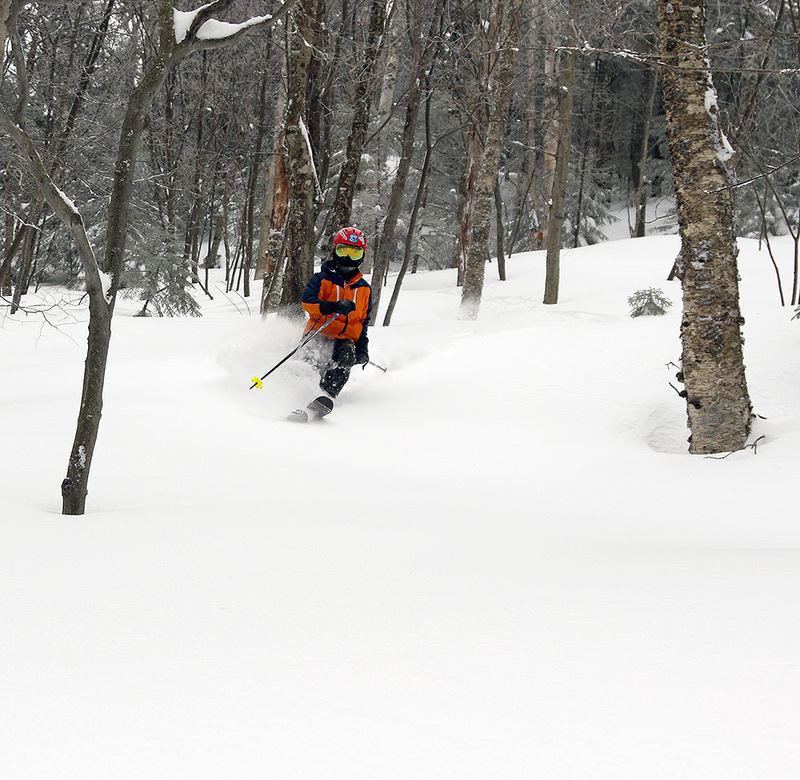 I ripped off my skins and cruised through some of the back side glades in 10 to 12 inches of pristine powder. 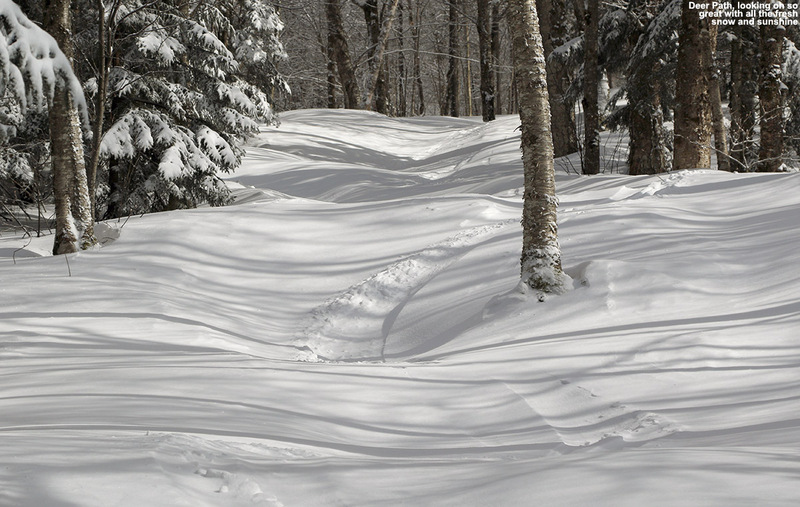 That snow was very high quality, similar to what I’d found on the west side glades on Woodward Mountain during yesterday’s tour, and the run was over way too quickly. I skinned back up to the ridge, and headed northward a bit more to gain some additional elevation for a front side descent. The front side Holden’s Hollow Glades had definitely seen some traffic, and I found that I was touching down to the subsurface in areas that been previously packed out by skier traffic. 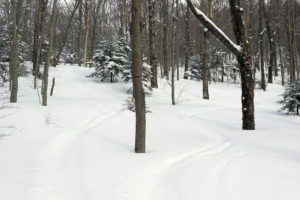 I ended up heading a bit to the skiers right of the glades there to catch the best snow. 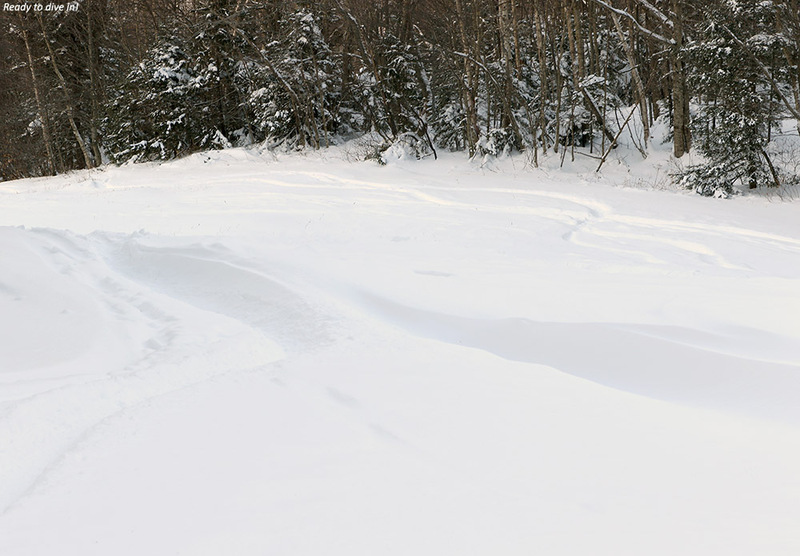 This time, for my return trip to the car, I put my skins back on to cross the flats in the Pond Loop area, instead of just managing the traverse on skis alone. It’s hard to say if it made the trip back to the car faster overall with the time required to stop and reapply skins, but it was definitely nice to make the trek without ever sliding backwards. 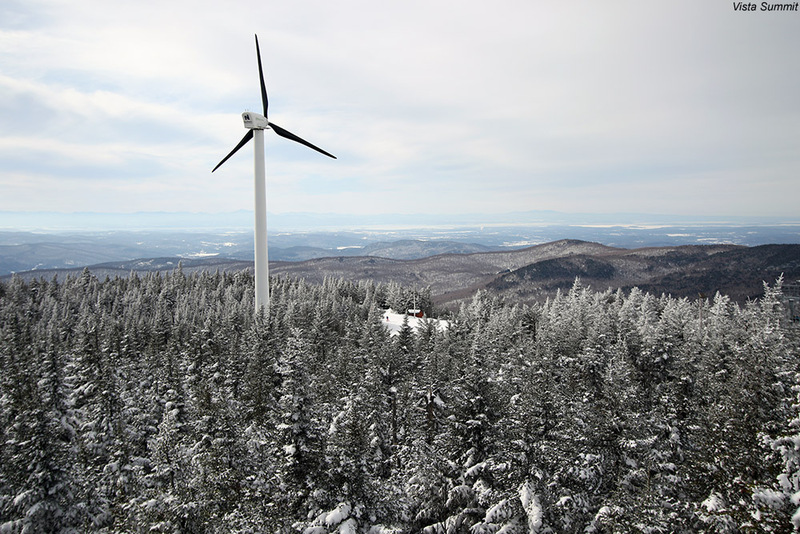 The snowpack is currently in great shape here in Green Mountains of Northern Vermont, with the Mt. 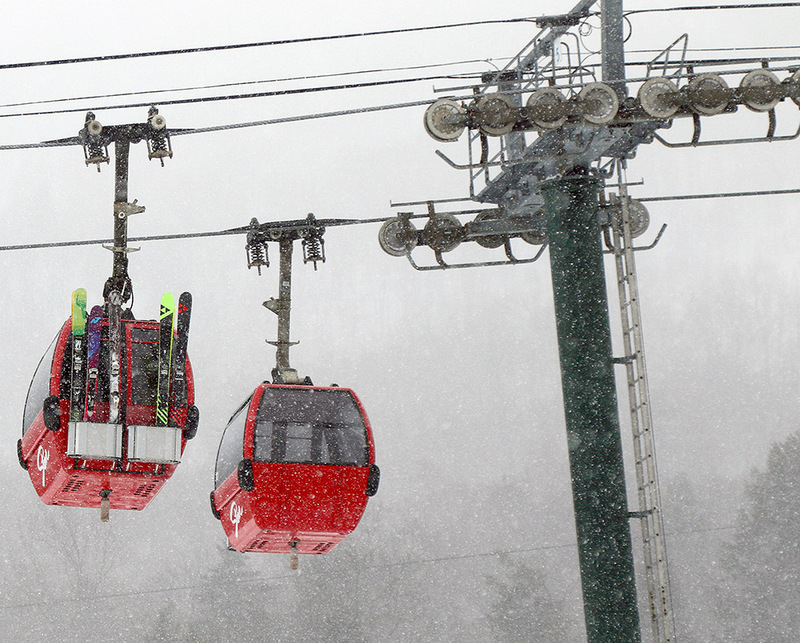 Mansfield Stake up near 4,000’ recently hitting 100 inches. Solid depths are evident at all elevations though, even down to the lowest mountain valleys. 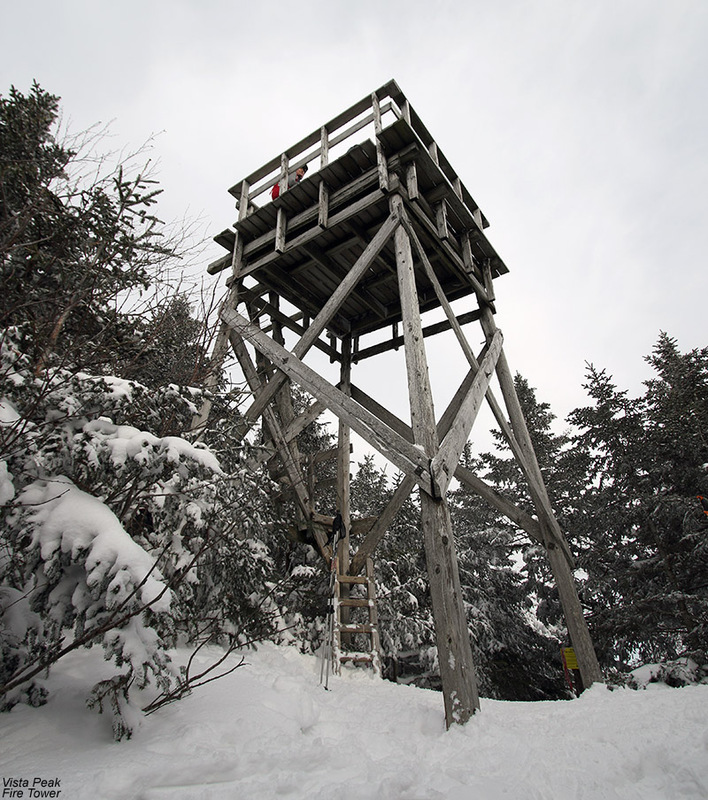 At our house, which sits at an elevation of roughly 500’ near the bottom of the Winooski Valley, the snowpack has been in the 2½ to 3-foot range since the end of January. 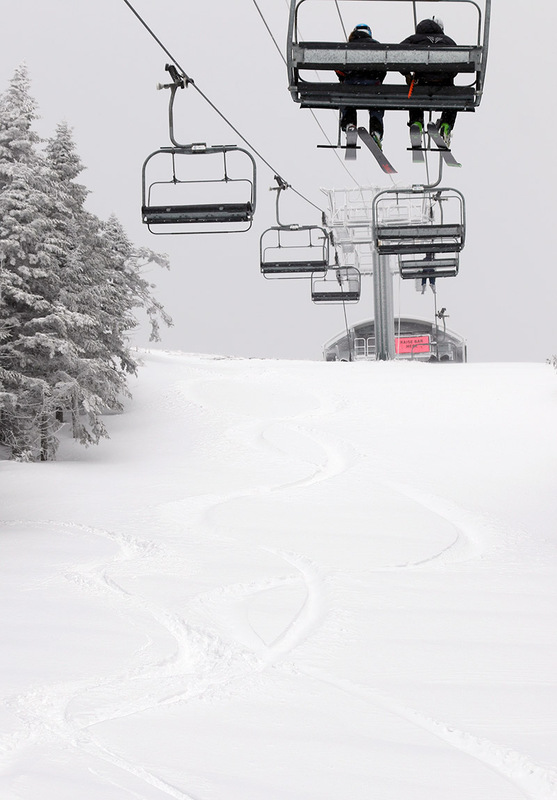 Snow conditions are also great right now, with Bolton Valley Resort reporting 25 inches of snow in the past few days. When snow conditions are good, and the snowpack is like this from top to bottom, it’s a great time to consider some of those longer backcountry descents that really make use of all the vertical around here. The trip that came to mind today was the Woodward Mountain Trail. E was feeling a bit under the weather, but I figured I could take the boys on the tour, and E said she could still help out with the car shuttling. We didn’t have a full day to spend, so I wasn’t going to initiate the tour unless we could get it done fairly expeditiously. 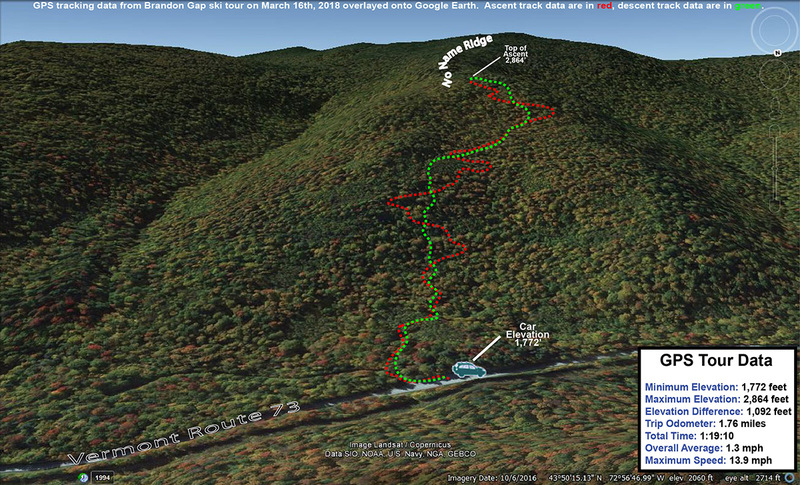 I’d scoped out the bottom of the trail and found the most efficient exit on a tour last March, but my touring in the Goose Pond area had only gotten me mildly familiar with the start of the trail up on the ridge line. 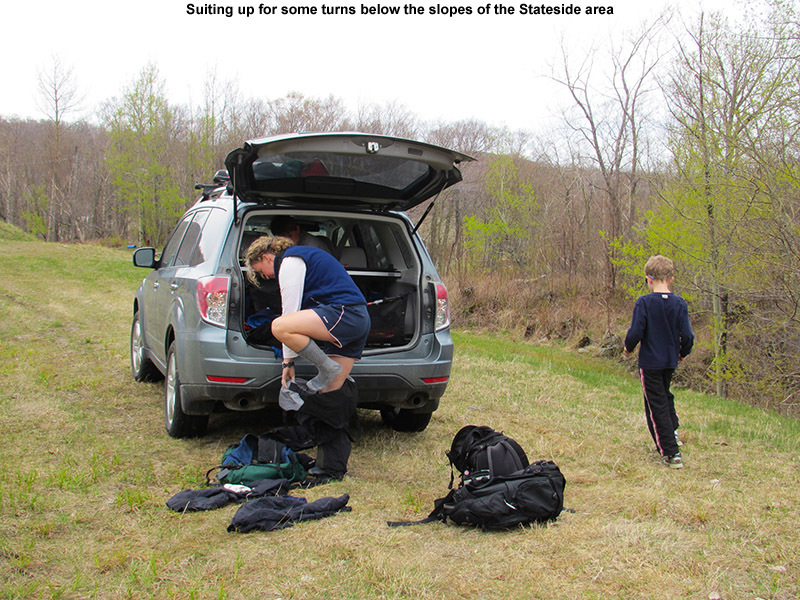 I decided to check my copy of David Goodman’s classing backcountry guidebook “Backcountry Skiing Adventures: Vermont and New York” to get a better feel for the ridgeline part of the trail. After the initial descent from the Vista Peak Fire Tower the guidebook mentions that the trail “climbs gently, but steadily up a ridge”. That was enough to convince me that I needed to do a bit more reconnaissance before bringing the boys, so I set my sights for today on an exploratory tour along the ridge line. Arriving at Bolton Valley, my tour kicked off with a ride on the Vista Quad, which whisked me right up to the Vista Summit. 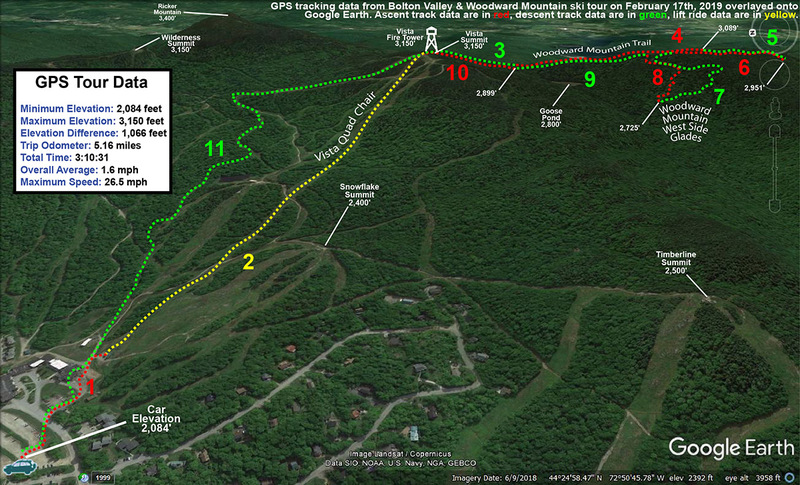 I stopped in to check on the views from the Vista Peak Fire Tower, and then continued on the Woodward Mountain Trail. The first few minutes were on terrain that I’d been on before – the descent from Vista Peak down to the col that separates it from Woodward Mountain. 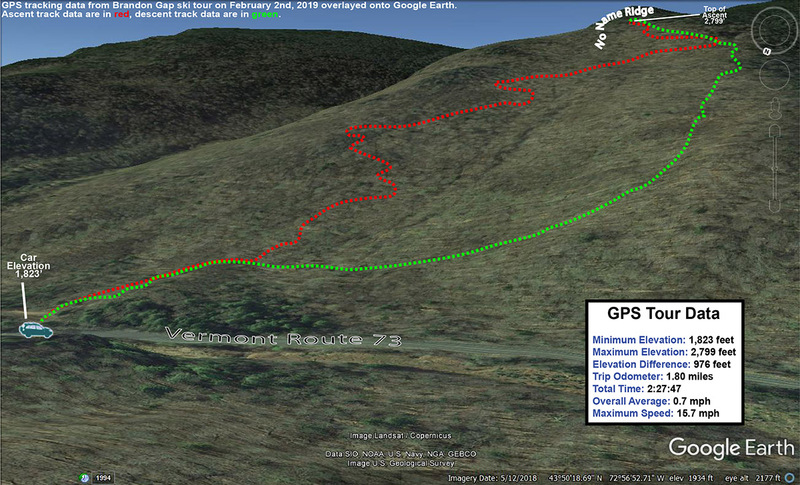 As advertised, the trail rose gradually after that point. I opted to go without skins for a few minutes, but eventually decided that putting on my skins would be the way to go. I’d say that was the right choice, because there was at least another 10 minutes of climbing before the trail began to level off. I followed the trail out to the point where it began to descend through some of the route’s open glades, then turned around and headed back up to the Woodward Mountain summit area. I still had a bit of time to explore, so I decided to check out some of the glades on the west side of Woodward Mountain as well. I followed a prominent spur trail the headed west off the Woodward Mountain Trail, and it eventually led down to some nice open glades dropping into the prominent valley that drains Goose Pond and is surrounded by Bone Mountain, Woodward Mountain, Vista Peak, and the Timberline Summit. The snow there was spectacular bottomless powder with no tracks. It was hard to pull myself away, but with the time I had available I had to skin back up to the Woodward Mountain Trail after only a partial descent of the glades. 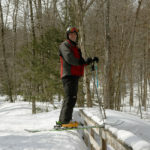 An excellent tour option would be to continue skiing on down the valley and hook back up with the resort by connecting to the Timberline Base the way we did on our Bone Mountain tour. That potential tour will have to wait for some time in the future though, so I’ll just have to add it to the ever growing list along with the Woodward Mountain Trail. 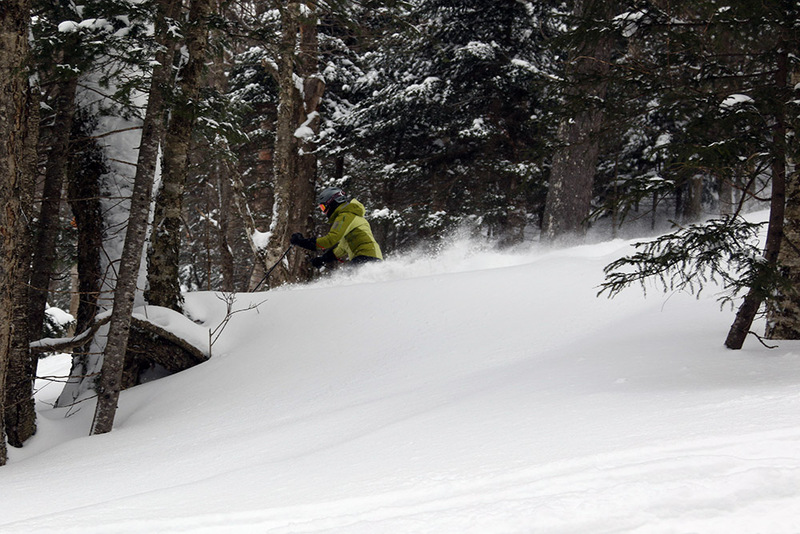 Dylan in the Villager Trees floating through some of the 25 inches Bolton picked up over the last three days. 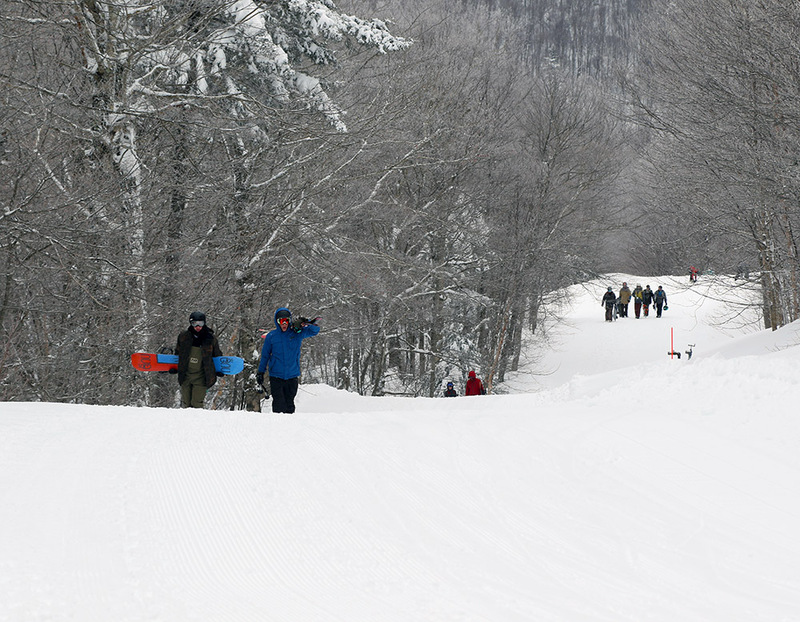 In the past 72 hours Mother Nature has dropped 25 inches of snow on Bolton Valley, and with the first part of that accumulation coming in quite dense, it’s been a great resurfacing of the slopes. The bulk of the snow came from Winter Storm Maya during the early part of the week, and the last few inches came from a slightly warmer storm that hit the area yesterday. 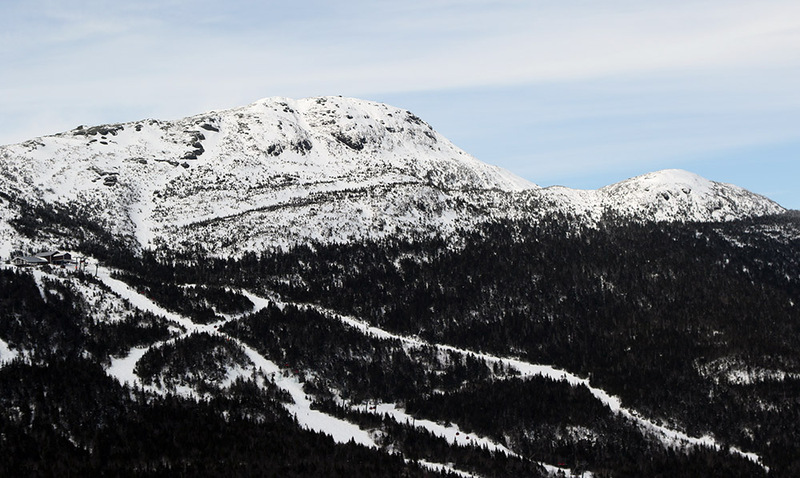 That system brought freezing levels above the base elevations of the local resorts, so we were eager to see how that played out with respect to the quality of the snow surfaces. We got to Timberline not long after the opening of the Timberline Quad, and encountered some briefly heavy snowfall that ended up sticking around in lighter intensity much of the morning to add a bit of freshening to the slopes. Temperatures were forecast to be in the mid-20s F, but it certainly felt a bit colder than that with the snowfall and some wind. We kicked off the day with an initial top-to-bottom run on Timberline to get a sense for how high the freezing line had gone yesterday, and the effects were definitely a gradient with respect to elevation. There was no obvious sharp line to note, but above 2,000 the effects seemed to be fairly minimal. Even below that elevation though, the mountain has seen several additional inches of accumulation, so there actually was great powder skiing all the way down to 1,500’. 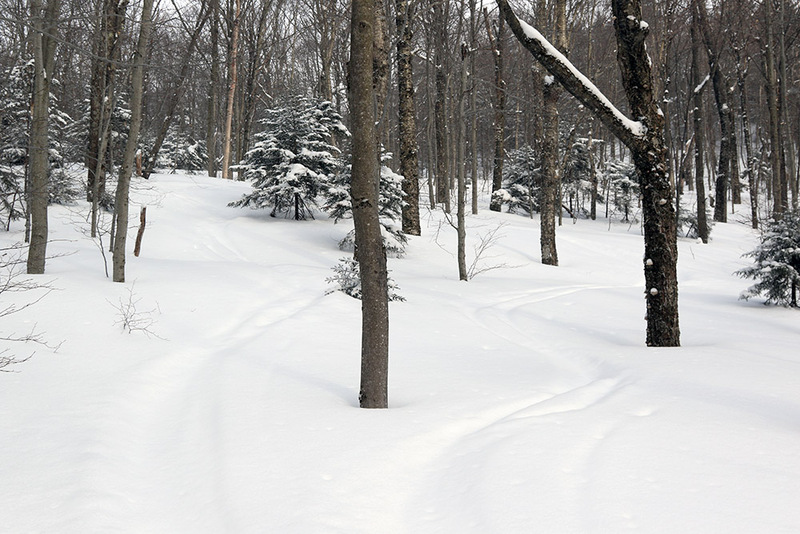 The areas that created the most trouble in our experience were where grooming had kicked up some chunks of dense snow to create an irregular subsurface. We headed over to the main mountain to take advantage of the additional elevation and catch some lunch after a bit more skiing. 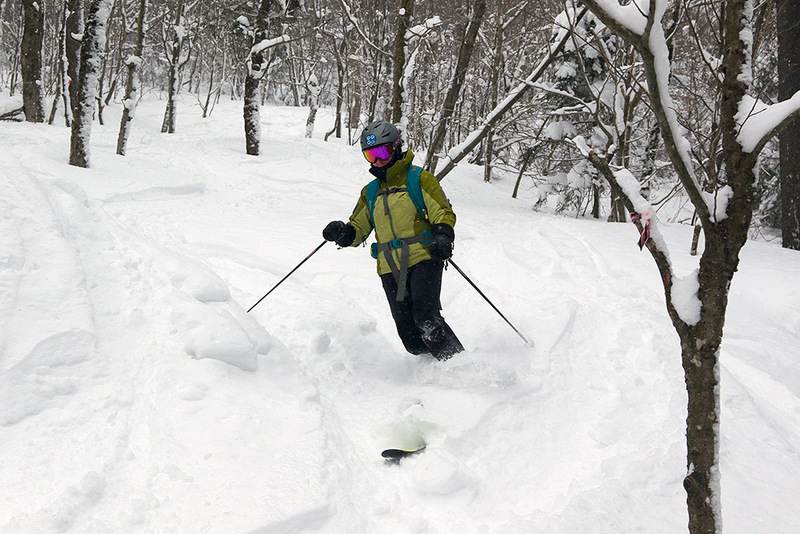 We had a great run on White Rabbit and Snow Hole, and indeed the depths of powder and quality of the subsurface just kept getting better and better the higher you went. We relaxed with a good lunch at the James Moore Tavern, and seemed to get in there just before it started getting busy. 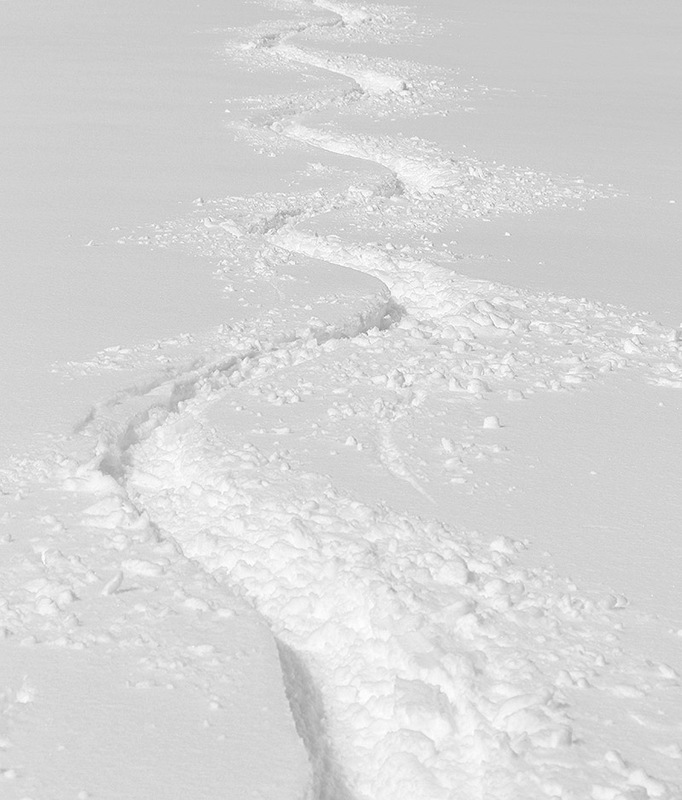 After lunch we headed up The Crack, found a lot of nice powder in Maria’s, then worked our way back to Timberline. We were still finding a lot of powder even at that point in the day, so we hung around for some additional Timberline runs, catching things like the Tattle Tale headwall, that was looking very steep and appealing to Dylan, and then some fun and games in the KP Glades where everyone seemed to get themselves covered in powder through various crashes or others purposely lacing them with the white stuff. 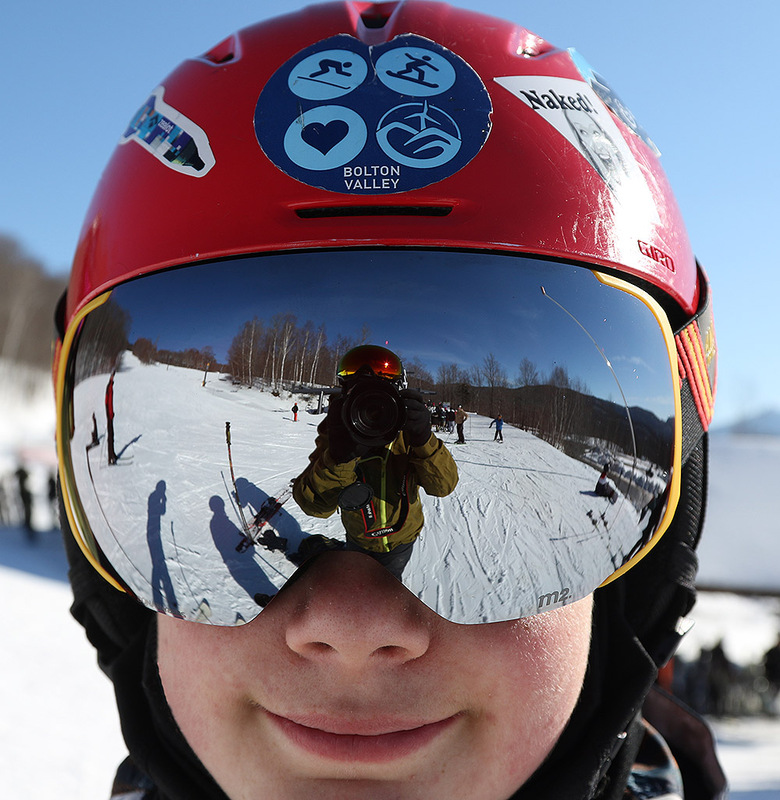 It is technically a holiday weekend, and while the resort was bustling, lift queues were almost nonexistent since the entire resort is open and everyone is well spread out. 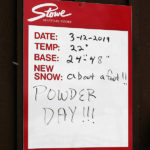 We even got word from Stowe that while the free days on our passes were certainly working there, the resort was really busy due to the holiday, so people should be prepared for that. Overall though, it’s just great that the resorts are getting such excellent conditions for a big holiday weekend and upcoming vacation week. The snowfall was so intense on my ski tour at Timberline this morning, that my jacket was turning white just a few minutes into my ascent. 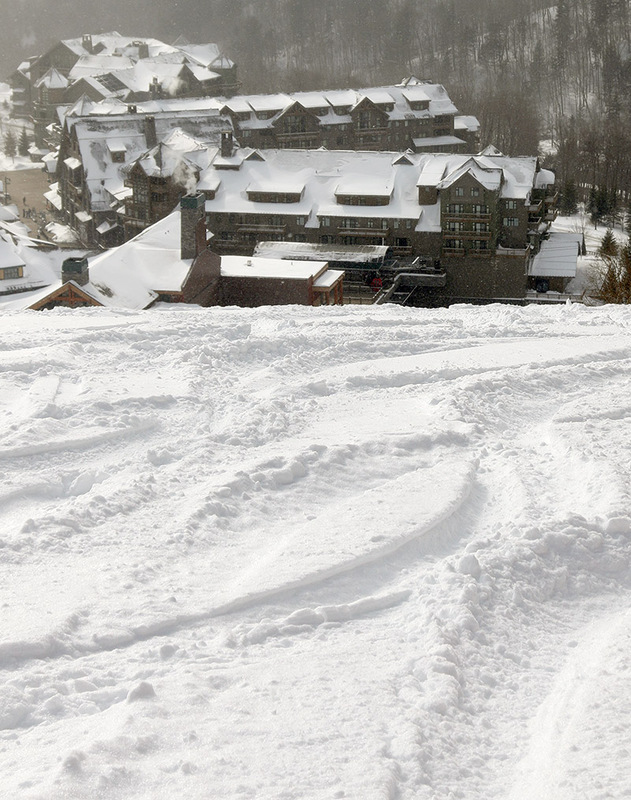 The current storm affecting our area has been named Winter Storm Maya, and as of this morning it’s already delivered a solid addition to the local slopes with snow containing more than an inch of liquid equivalent. Snowfall began yesterday afternoon, and the flake structure has been producing some very dense snow – my analyses from at the house were revealing water content in the snow as high as 13-16% H2O! 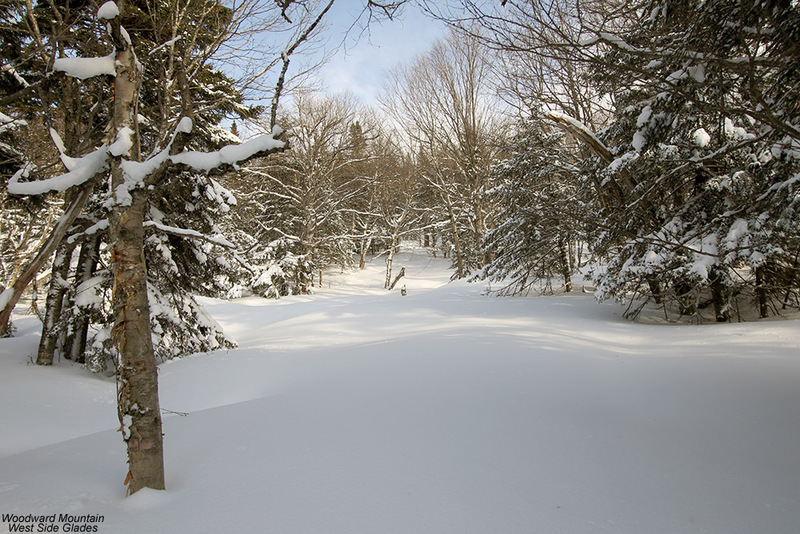 After doing some clearing of the driveway this morning, I headed up to the Timberline area at Bolton Valley to get in a quick ski tour before work. Temperatures have been warming throughout this storm, so I was greeted by some very nice temperatures way up into the 20s F at the Timberline Base. 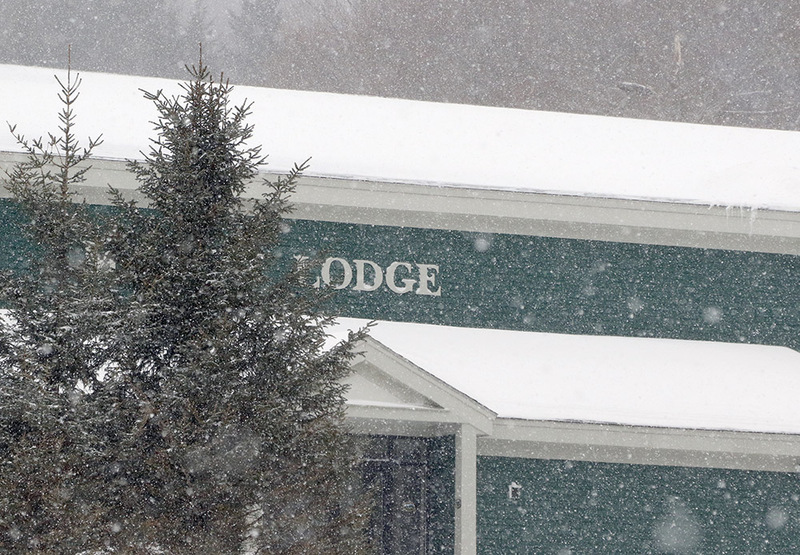 I was also greeted by pounding snow in the range of 1 to 2 inches per hour, with huge flakes and zero wind. The big flakes were coming down so hard that my jacket was turning white just a few minutes into my tour. The intense snowfall, big flakes, and no wind are fantastic conditions for building up fluff, and that was a welcomed addition to the accumulations from this storm cycle; based on what I saw from my snow analyses at the house, there is probably some upside-down character to the initial accumulations we’ve had on the front end of this event. 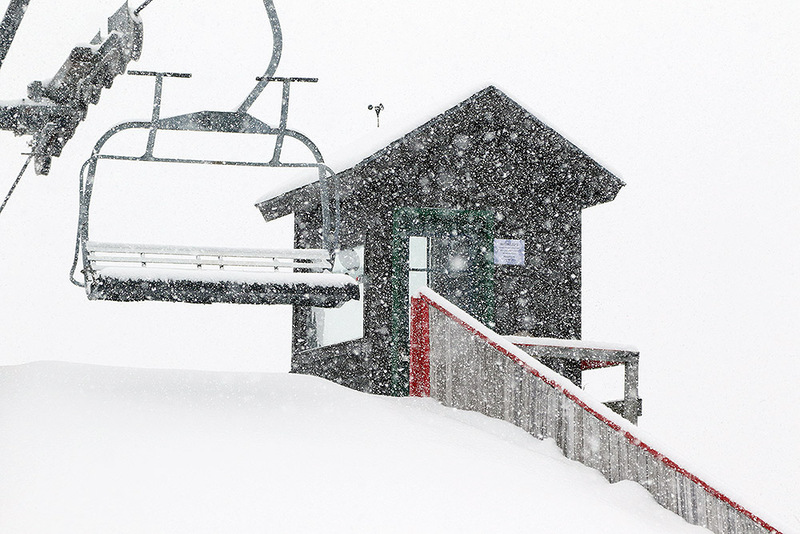 The snowfall continued to pound down as I reached the Timberline Mid Station this morning. The Timberline Base was really deserted when I was up there this morning; there was just one other car in the lot, and the skin track had already picked up three inches of new snow since the last person had used it. I guess filling in the skin track doesn’t take too long when it’s snowing at an inch or two per hour, but it was still surprising. The accumulations I found from this storm so far were 9-10” at 1,500’ at the Timberline Base and about 12-13” at 2,500’ at the Timberline Summit. 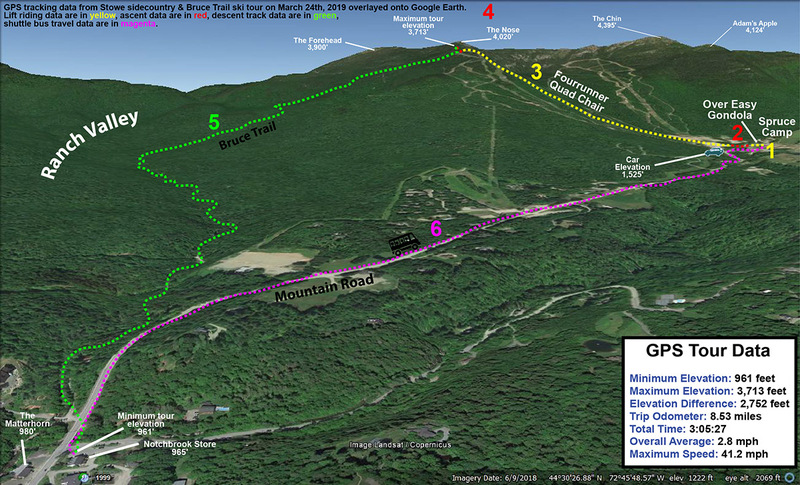 That pounding snowfall probably did bump up that upper number a bit, even over the course of just a half hour ascent. 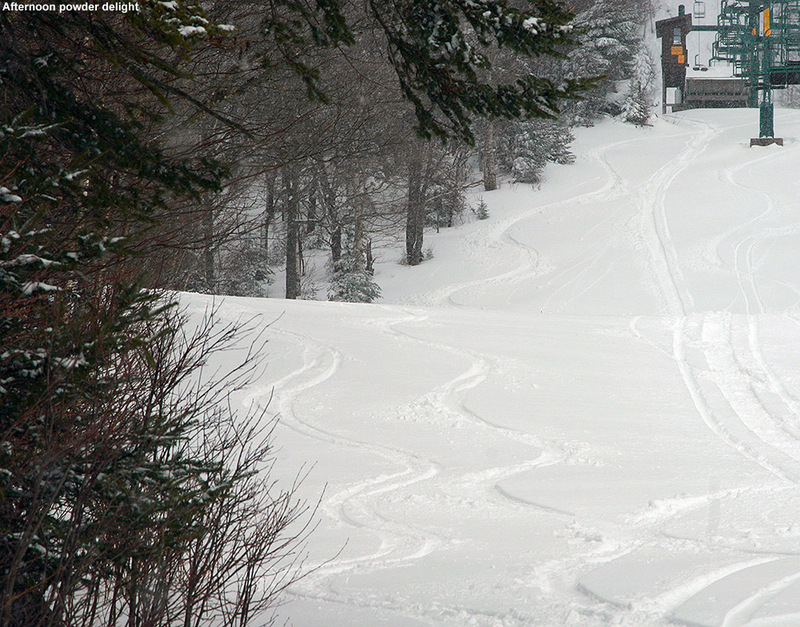 A view of the upper part of the skin track on Timberline this morning as it slowly disappears in the heavy snowfall. The trip down Intro was fun, since the initial snow’s hefty density meant great coverage even in spots that might typically get scoured a bit by the wind. Below the Timberline Mid Station, I opted for Twice as Nice, because the only skier traffic I could see there was the vestiges of one old track. Boy did the mountain get a resurfacing though – you had to really try hard to find the old subsurface, and for the most part, it’s now just a distant memory. Winter Storm Maya has definitely been a shot in the arm for the snow conditions so far though, and there’s plenty of snow still to come. The 3 to 4 inches of fluff on top of the denser snow definitely set the skiing right-side-up this morning, so turns are looking really nice for the foreseeable future. 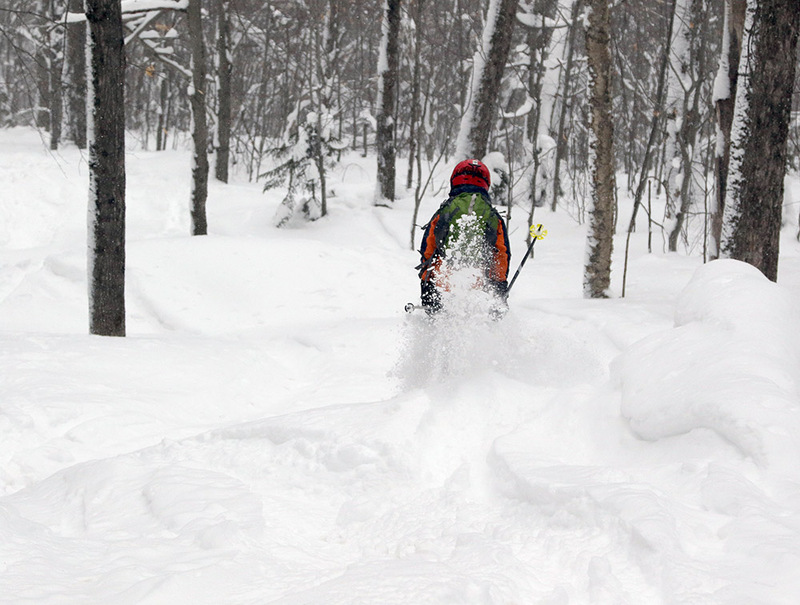 Ivan blasts through some of the powder we found today on our ski outing at RASTA’s Brandon Gap backcountry recreation area. 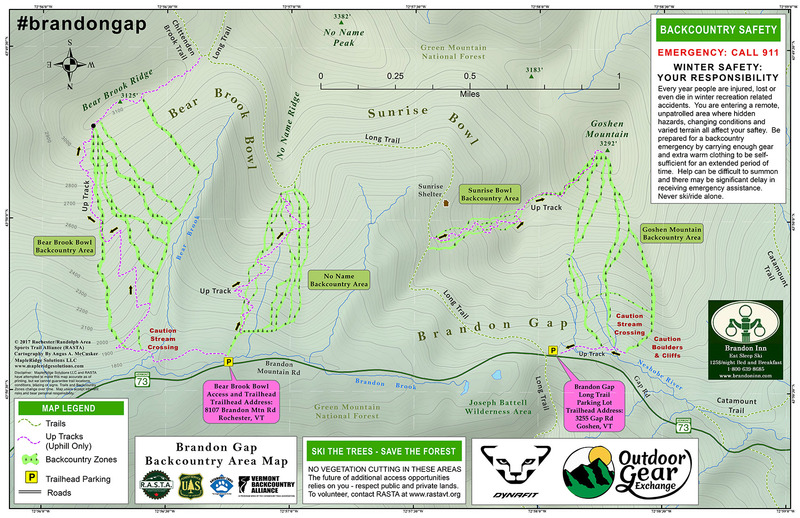 Today the family headed to Brandon Gap for some backcountry skiing. 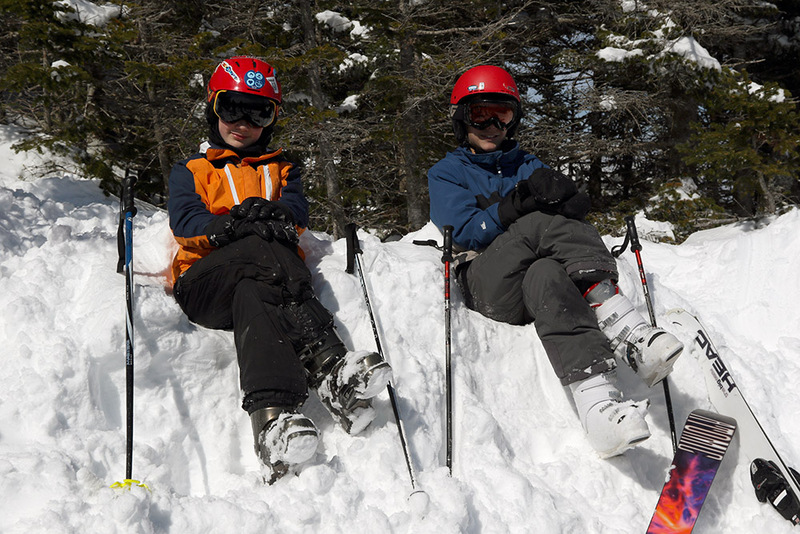 Dylan’s friend Ivan is visiting, and he joined us as well for his very first backcountry skiing experience. 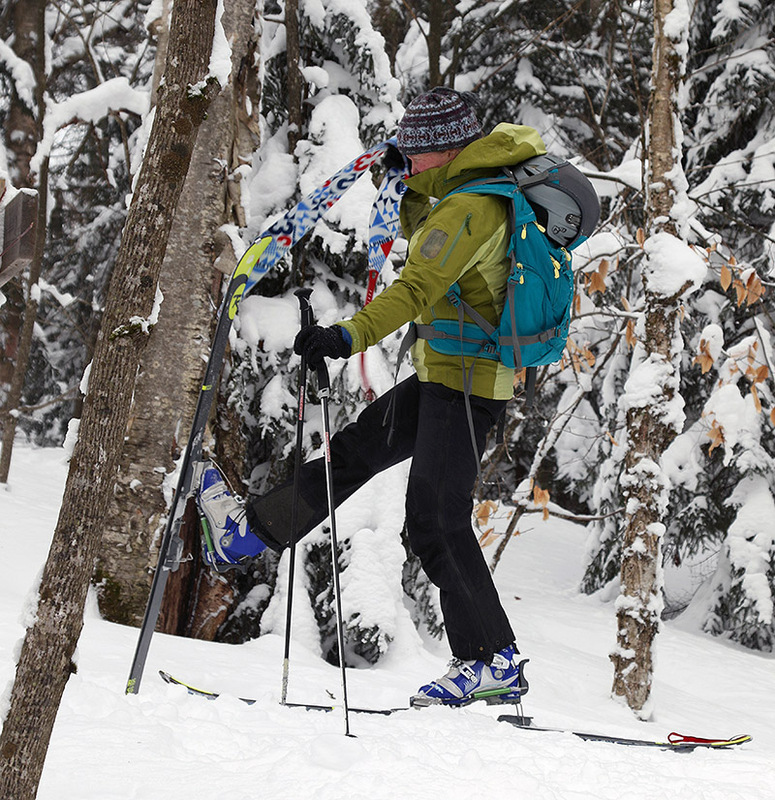 He doesn’t actually have any backcountry ski gear, but we were able to set him up with some Alpine Trekkers and a pair of Erica’s older skins that fit his skis almost perfectly. 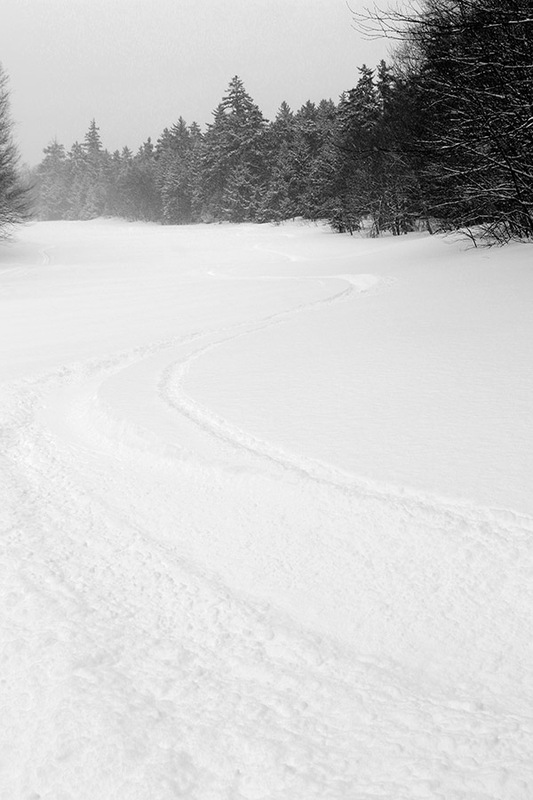 We also had the advantage of nicely warning temperatures today, so we waited until the afternoon, and arrived at the Bear Brook Bowl Access and Trailhead on Vermont Route 73 to cloudy skies and temperatures around 20 F.
There are multiple trail pods at Brandon Gap, but for this tour I chose to stick with the same No Name Backcountry Area that I’d visited last March. It’s an efficient touring area that heads right up from the parking lot with almost zero approach, and I didn’t expect we’d have too many curves thrown at us since I had a good idea of the lay of the land. 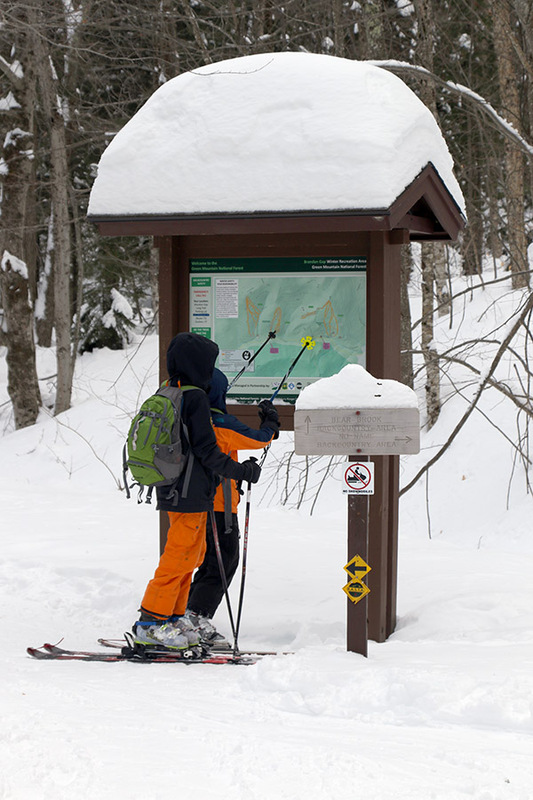 Dylan and Ivan check out the map as we begin our ski tour at RASTA’s Brandon Gap Backcountry Recreation Area this afternoon. 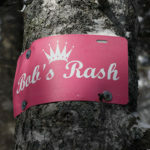 The skin track was well established as usual, and in this case it was almost a bit too well packed because there was some occasional slipping on the steeper pitches. We quickly found that all you had to do was slide a bit to the left or right into the untracked snow and you’d find sufficient purchase. Ivan had to get used to using the Alpine Trekkers, but by the end of the ascent he was really getting it down. There had been about a dozen other vehicles in the parking area, but we only saw one other group out in the No Name pod. For our descent we headed far to the skier’s left, father than I’d traversed on my previous visit, and we got to ski one of the leftmost glades that had perhaps three or four previous tracks. 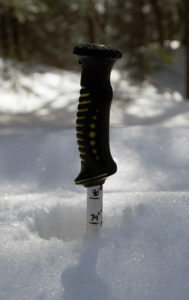 The terrain is generally in the 2,000’ to 3,000’ elevation range or so, and the snowpack is quite prodigious. It was too deep for me to easily estimate based on any pole measurements, but there really aren’t any deficiencies and everything you could possibly want to be covered certainly is. The powder we found was beautifully light and dry, and generally 12 to 24 inches in depth, with the highest reading I obtained at 26 inches. The composition of the subsurface was pretty inconsequential because you just weren’t having to get anywhere near it, but from what we could tell it didn’t seem overly crusty. Temperatures stayed very comfortable, and the skies were just cloudy until about midafternoon when it started to snow in association the new small system that’s coming into the area. Erica and Dylan have fun chaining up to try to help Ivan out of the powder today at Brandon Gap. We stopped off in the Mad River Valley for some Mad Taco on the way home, and business appeared to be booming based on how packed it was. I’m sure resorts throughout the state were loaded with visitors today thanks to the great conditions and moderate temperatures.